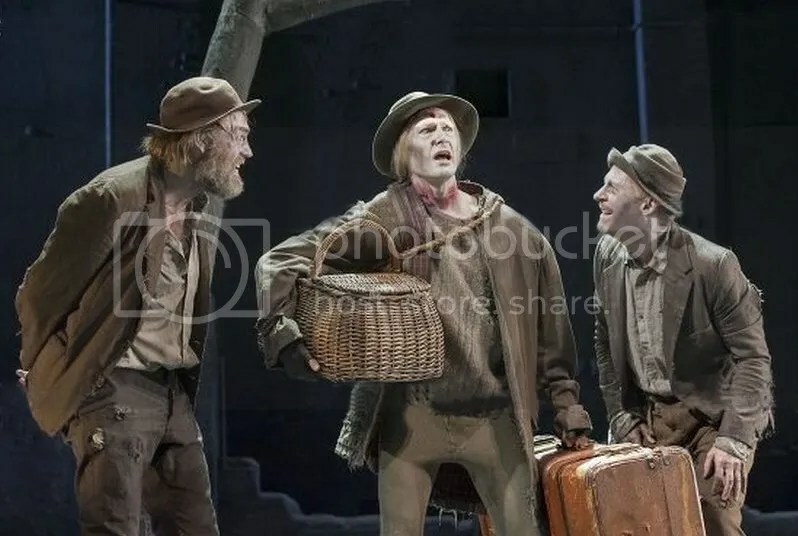 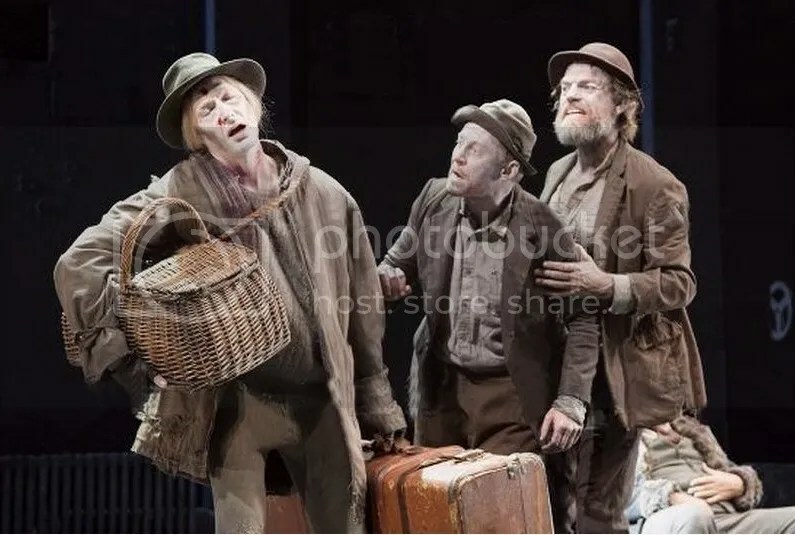 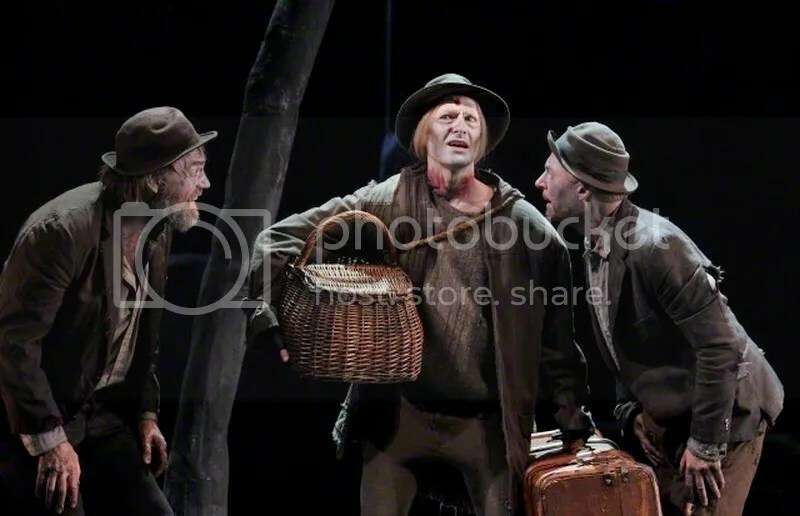 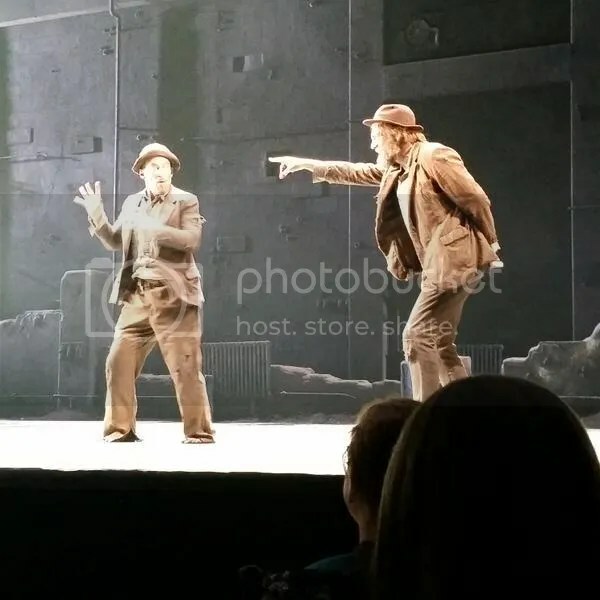 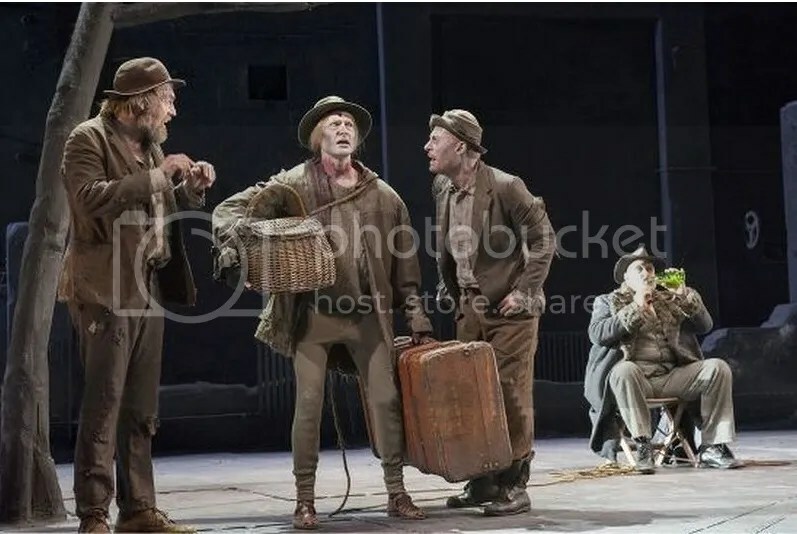 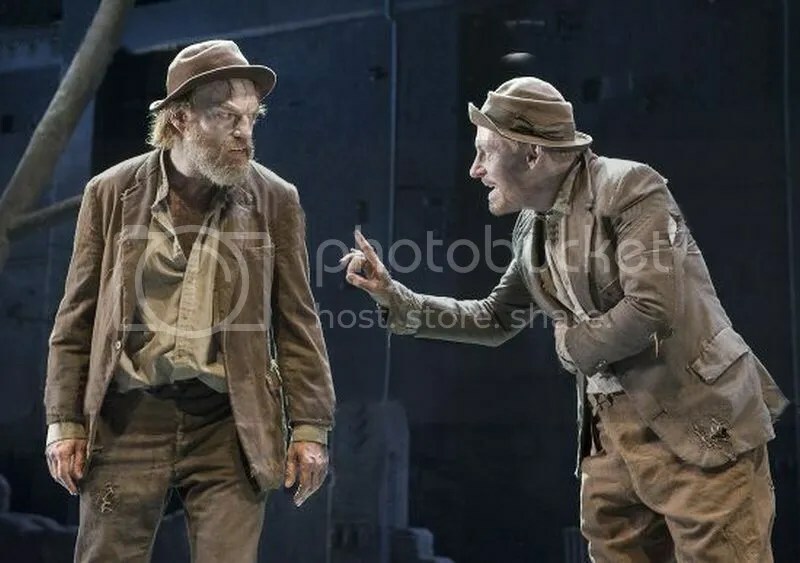 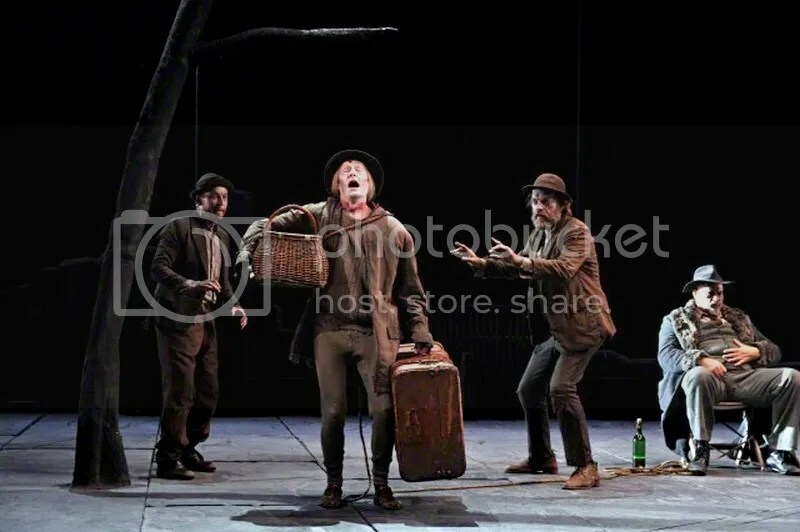 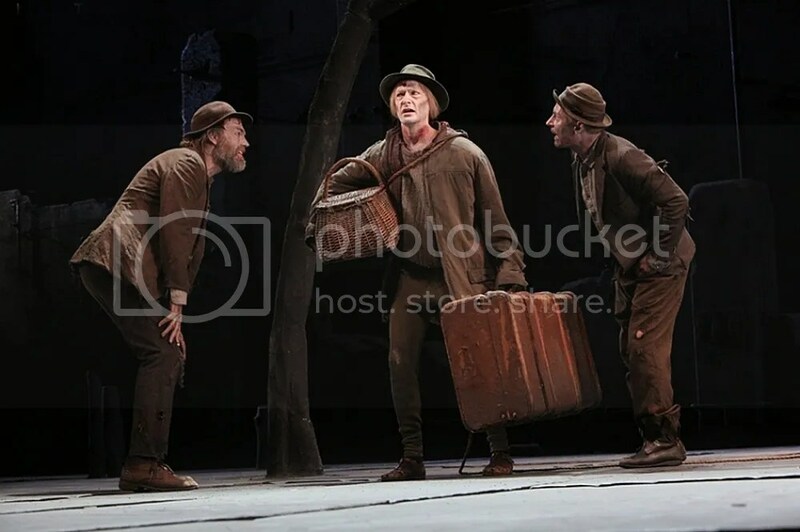 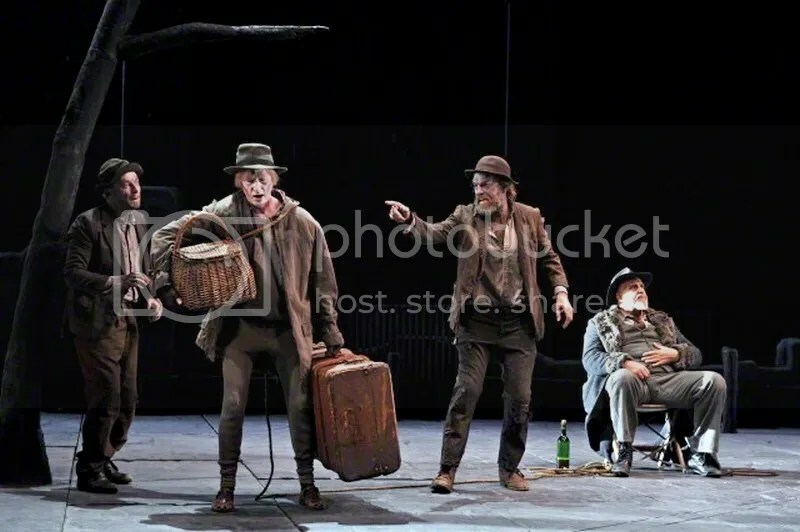 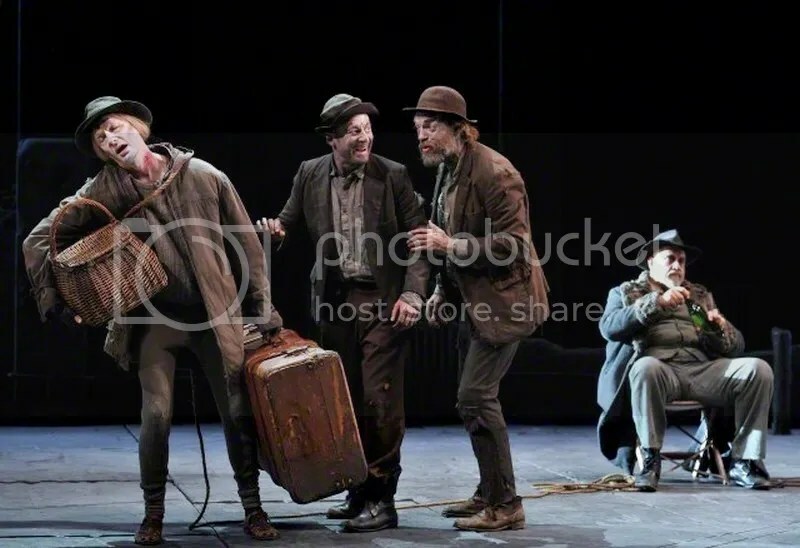 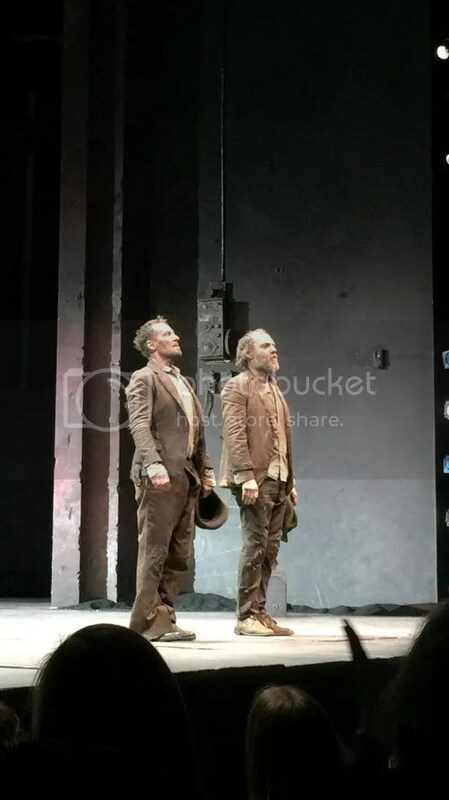 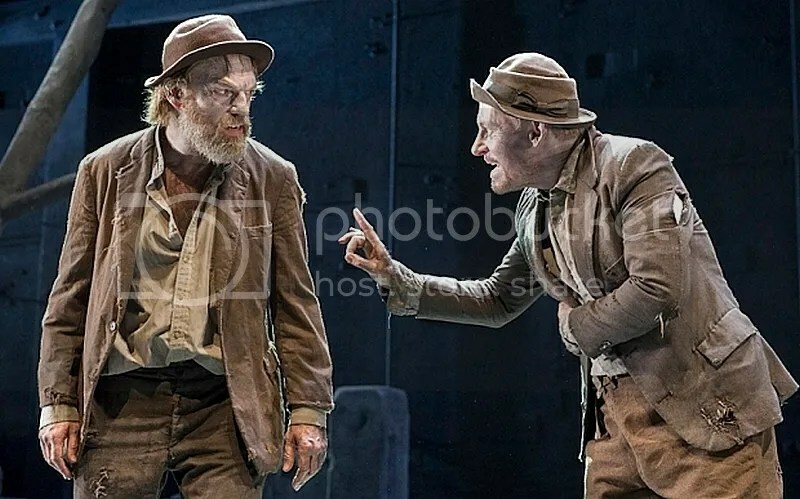 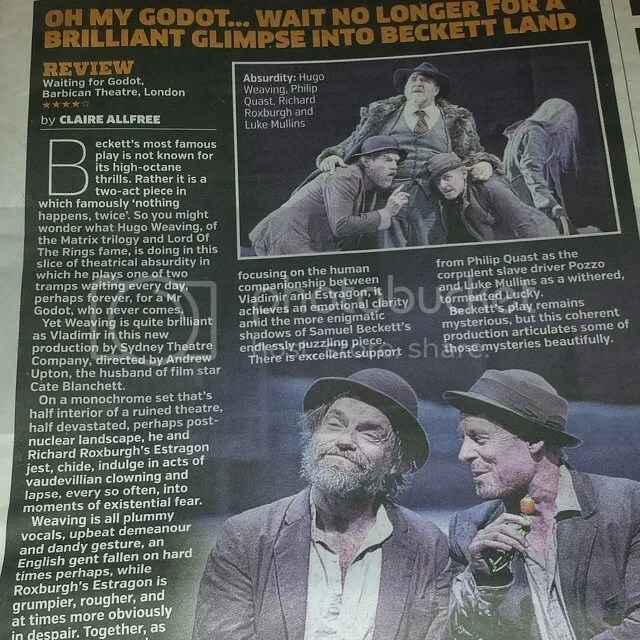 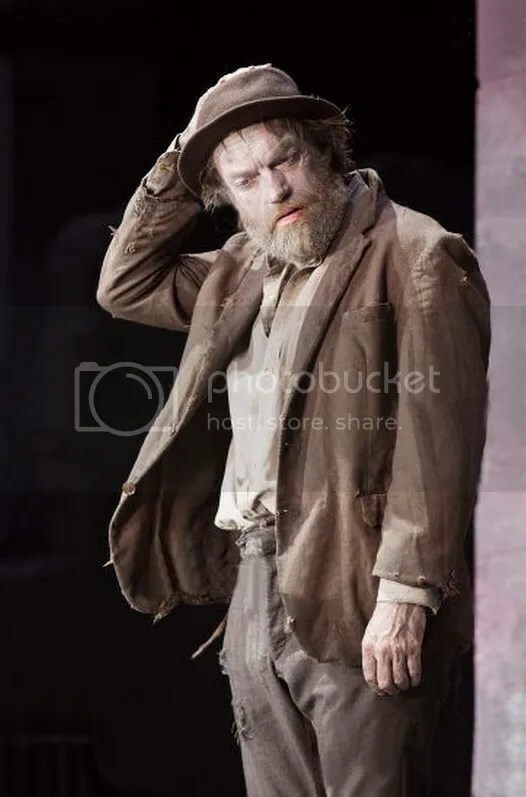 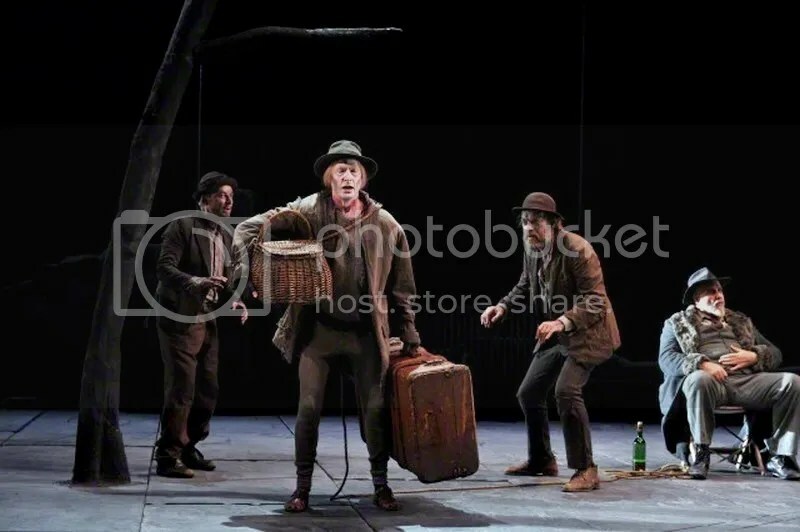 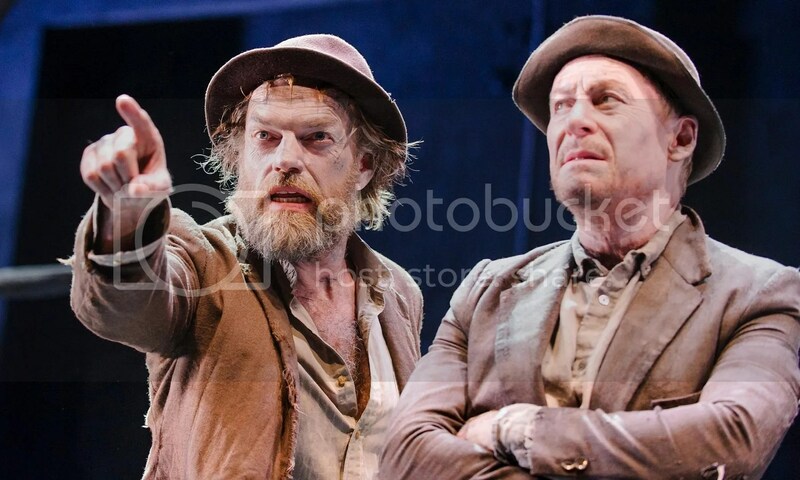 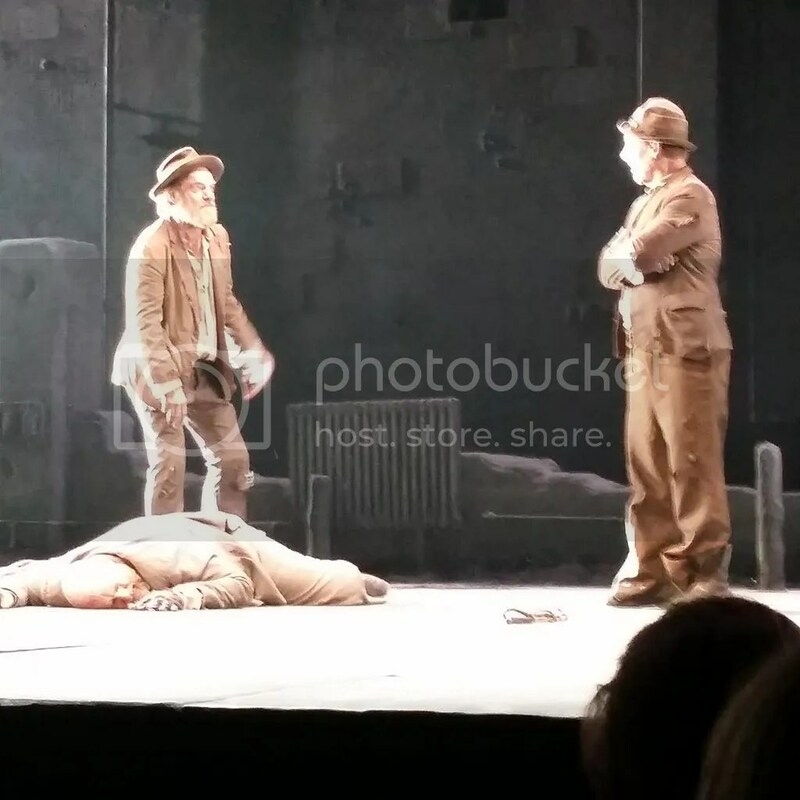 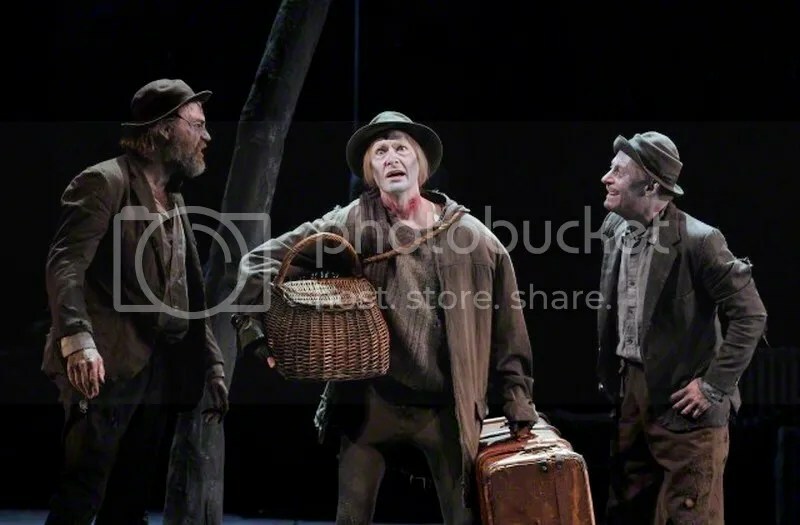 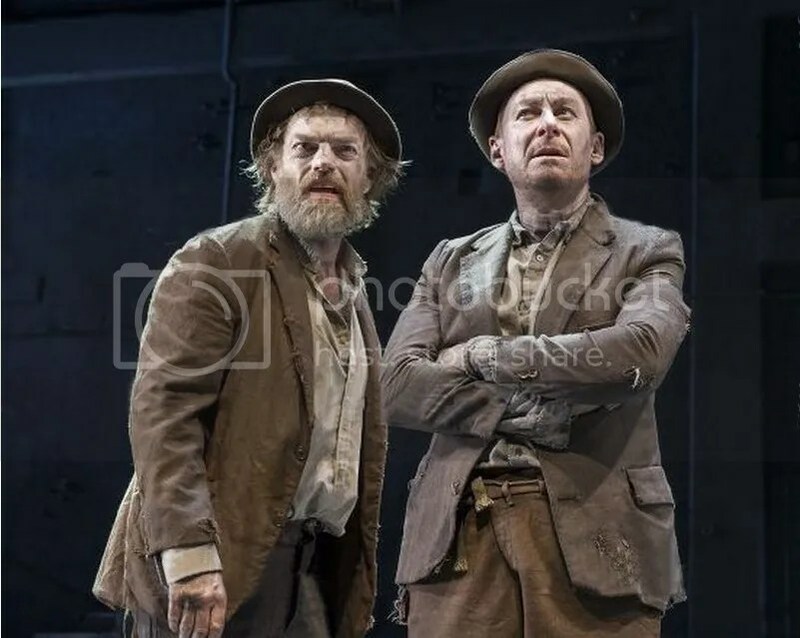 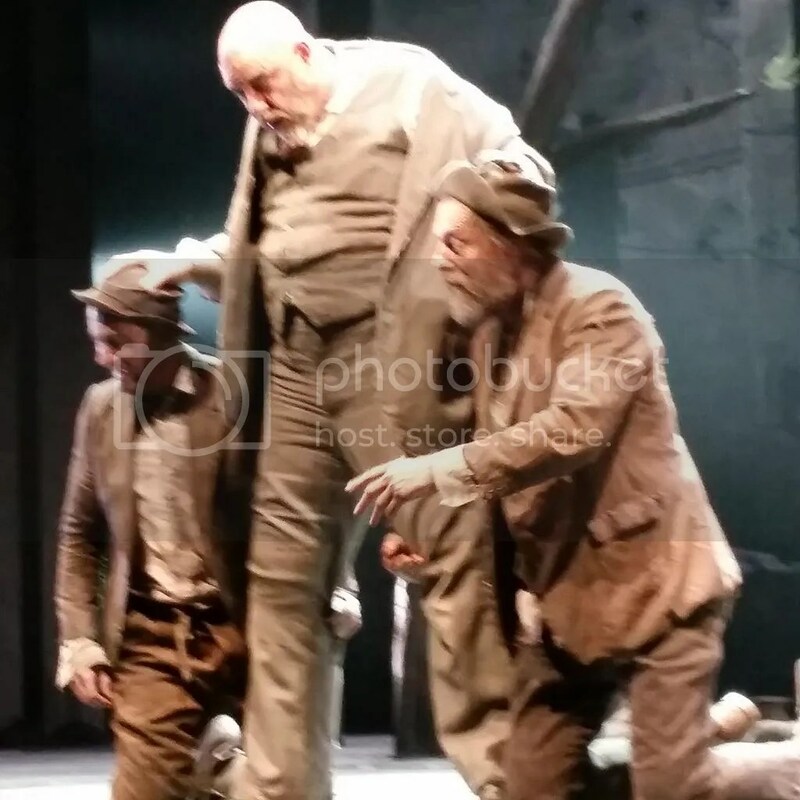 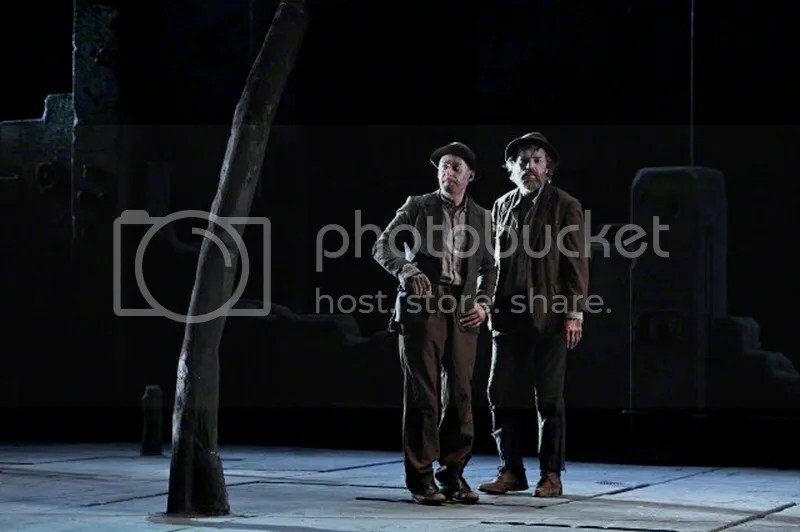 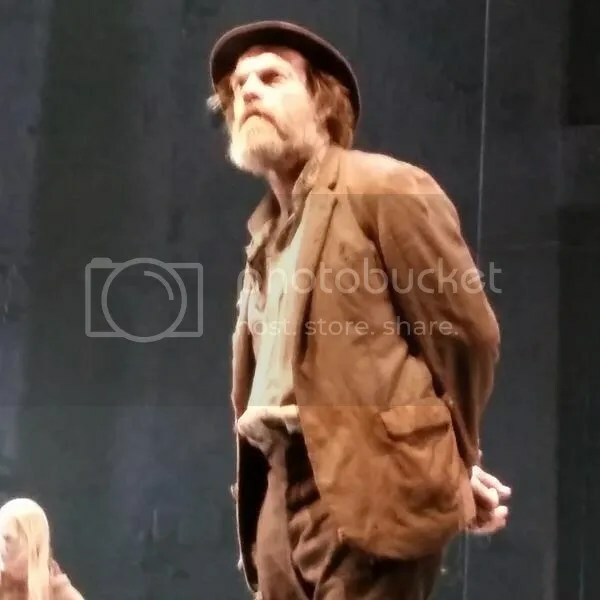 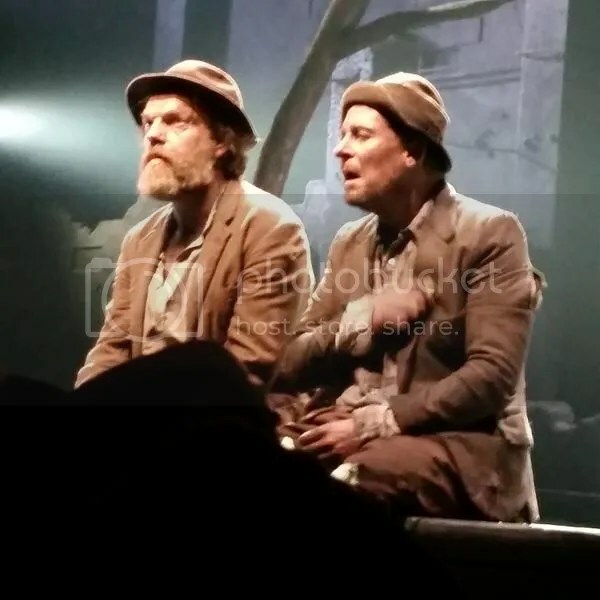 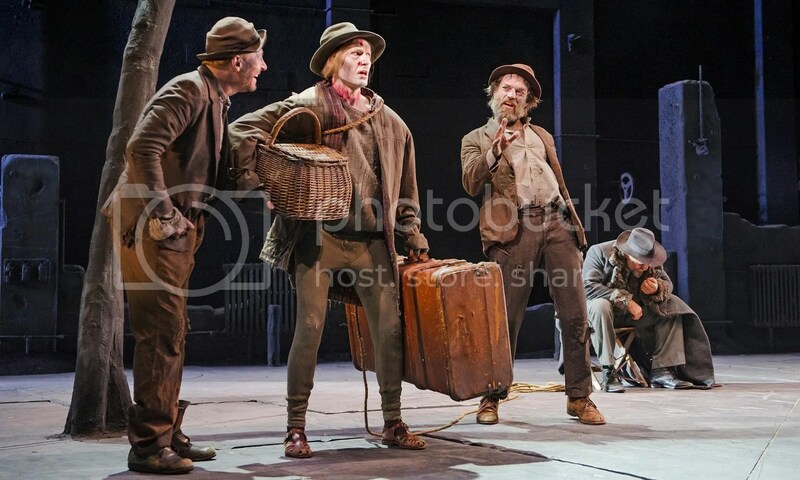 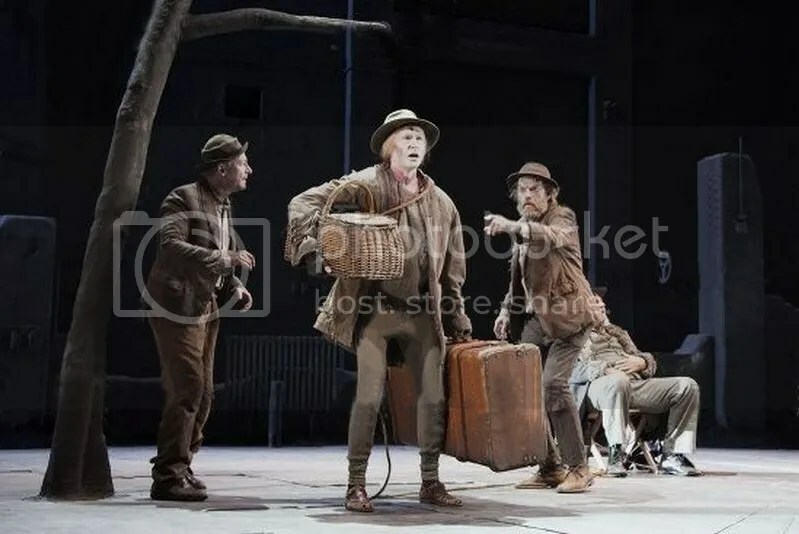 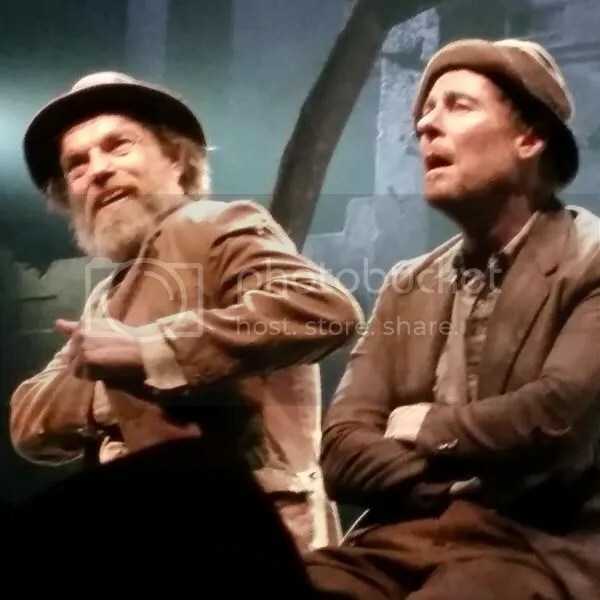 A veritable deluge of new material on Sydney Theatre Godot’s London engagement of Waiting For Godot has appeared over the past 48 hours, and I’m struggling to keep up, so I’ll apologise for any lack of organization or sloppy errors. 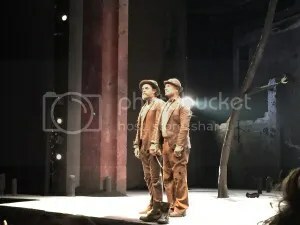 So far reviews from professional critics and audiences alike have been ecstatic, and we have tons of new production photos and fan photos. 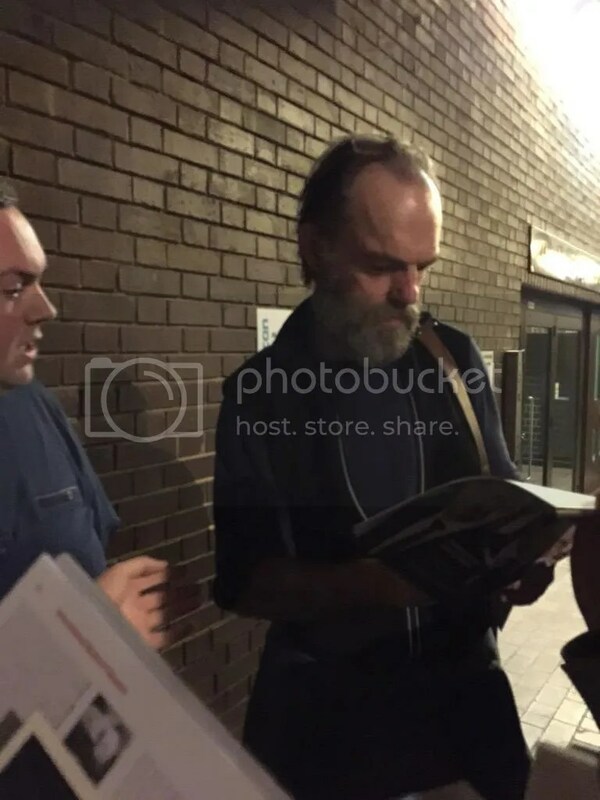 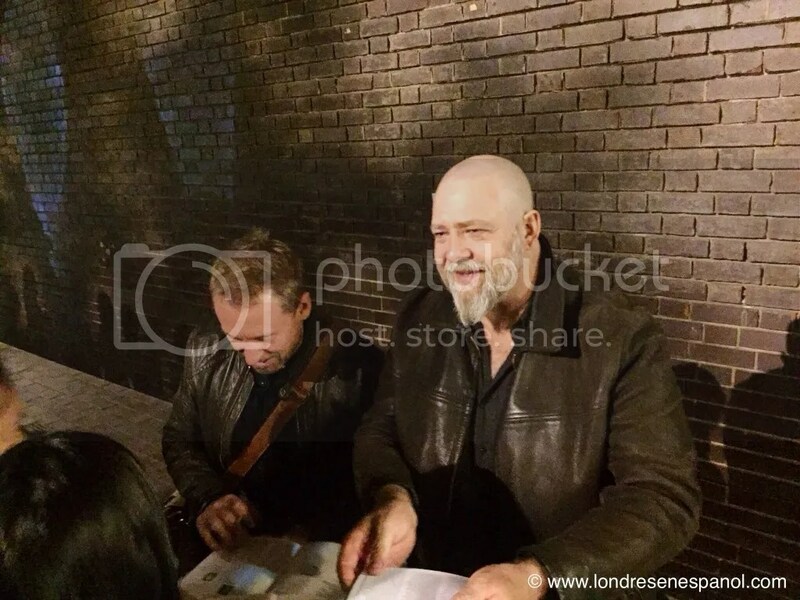 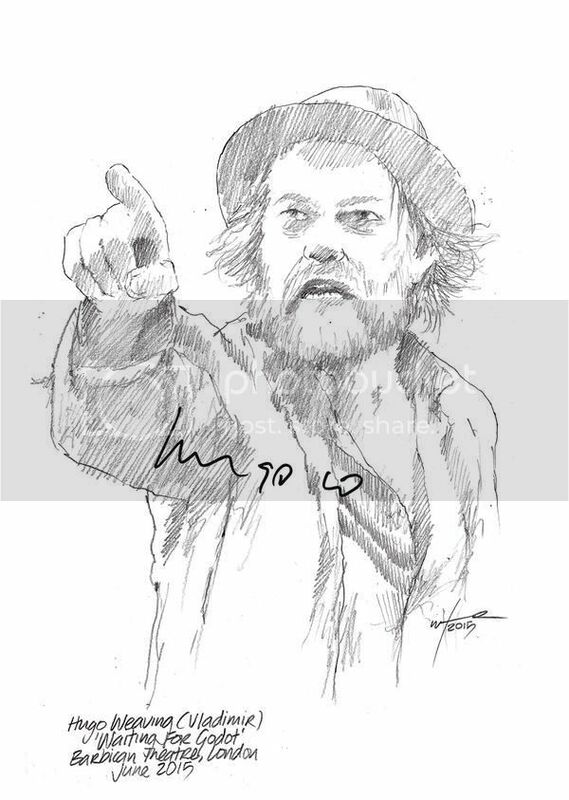 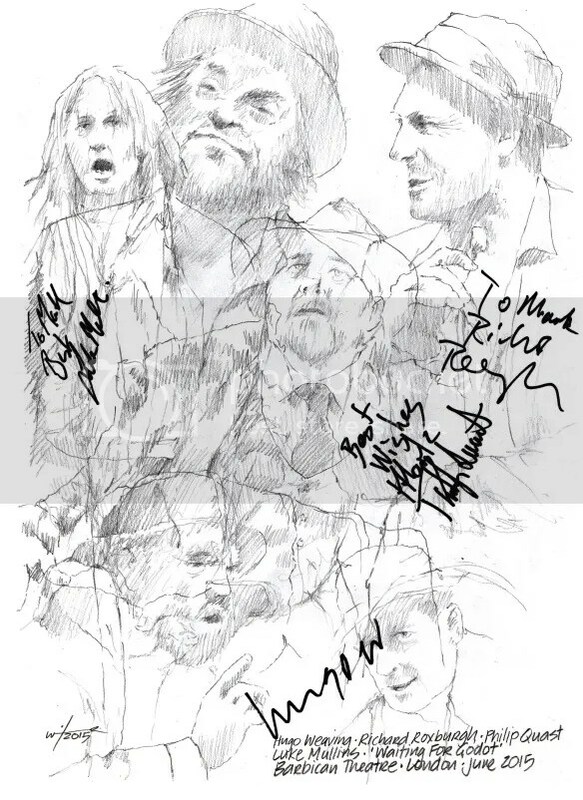 The cast have been very kind about signing programmes for fans at the stage door, but I should pass on the message that they’re ONLY signing Godot-related items, so leave your Matrix/LOTR mementos at home. 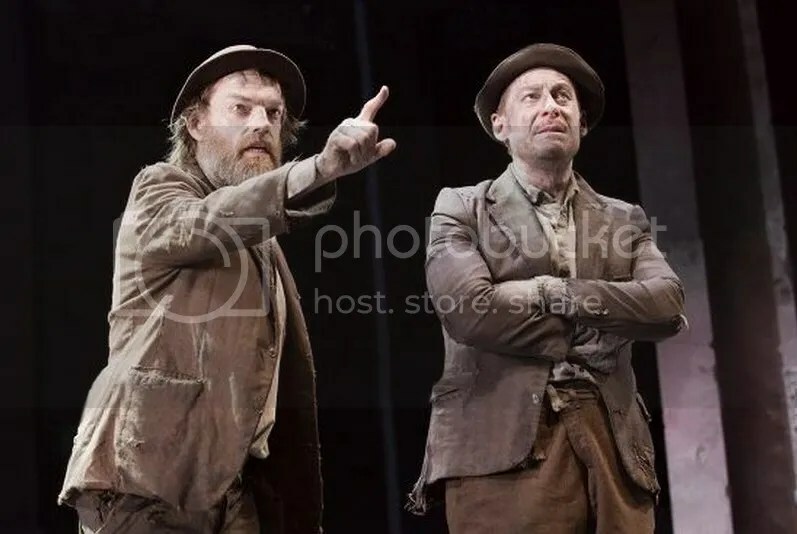 (This policy echoes that put in place for the New York run of an earlier production of Godot and Pinter’s No Man’s Land (Two Plays In Rep) which starred Patrick Stewart and Ian McKellen… On the whole it’s very sensible, though I’ve had Hugo sign “off-topic items” in the past. 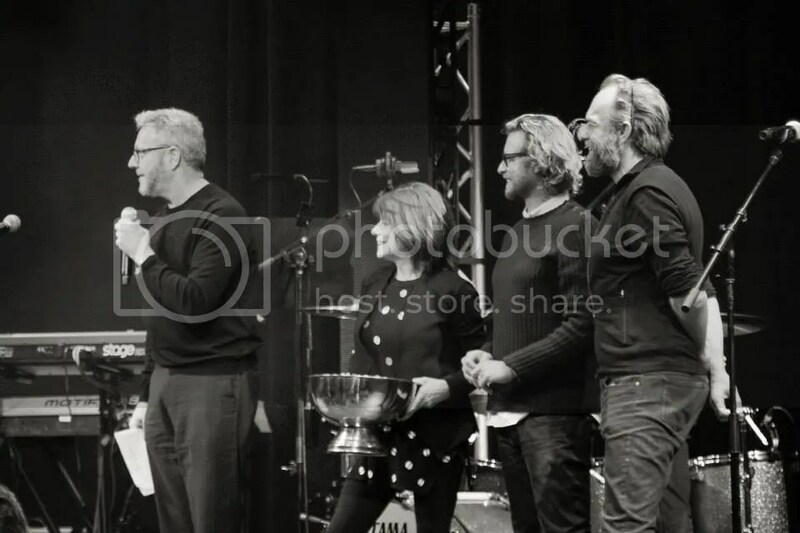 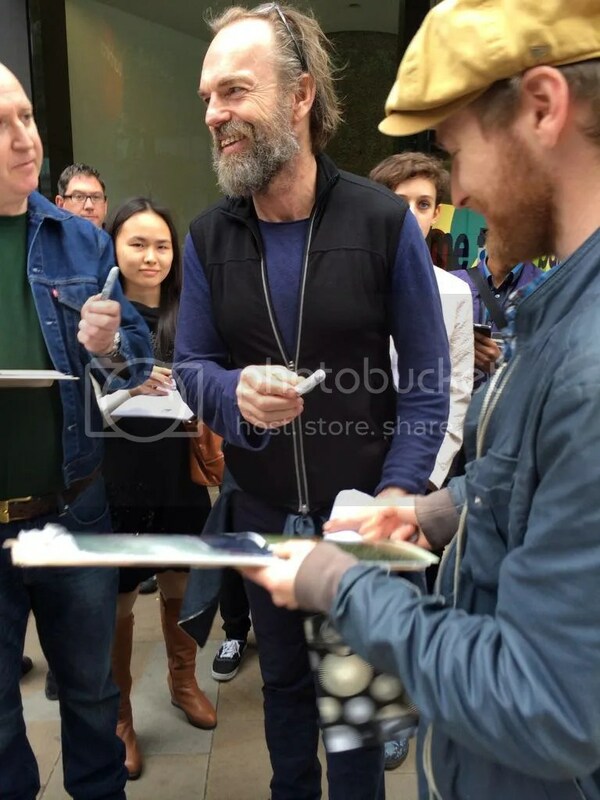 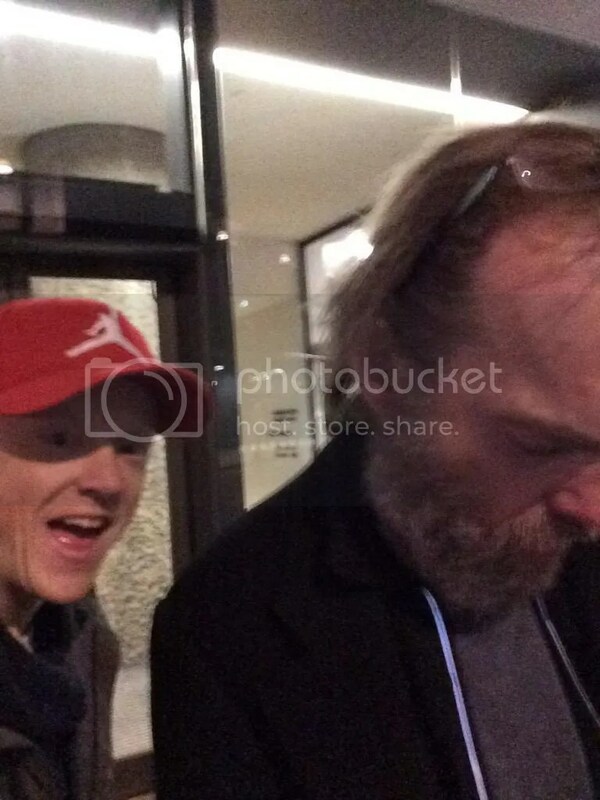 I think the actors are trying to prioritize fans who’ve actually bought tickets to see the play rather than gate-crashers who sell autographs online, and who constantly harassed Hugo during both the NYC of Uncle Vanya and at this year’s Sundance film festival.) 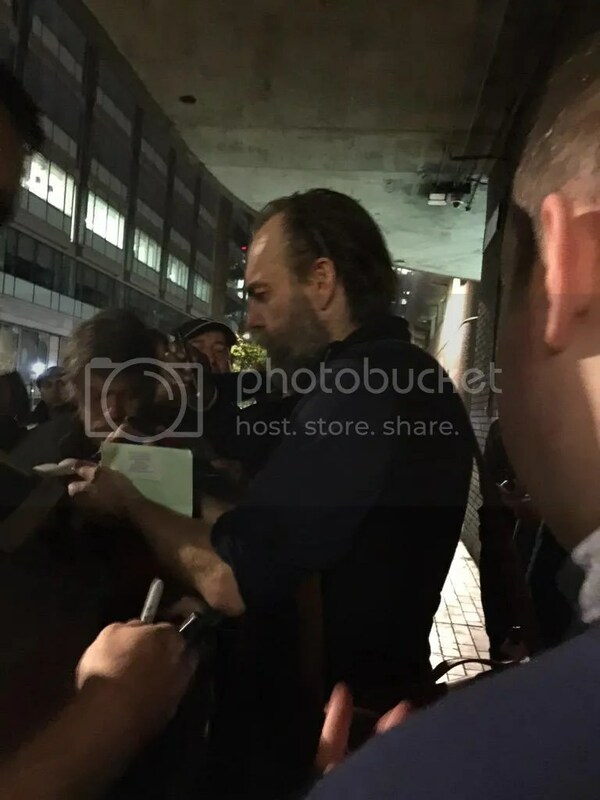 The feedback I’m getting so far is that the actors have been very generous about signing and posing for photos with fans. 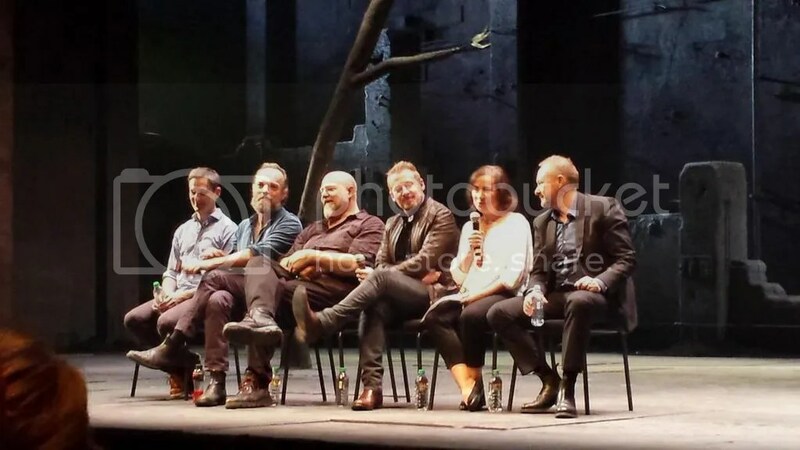 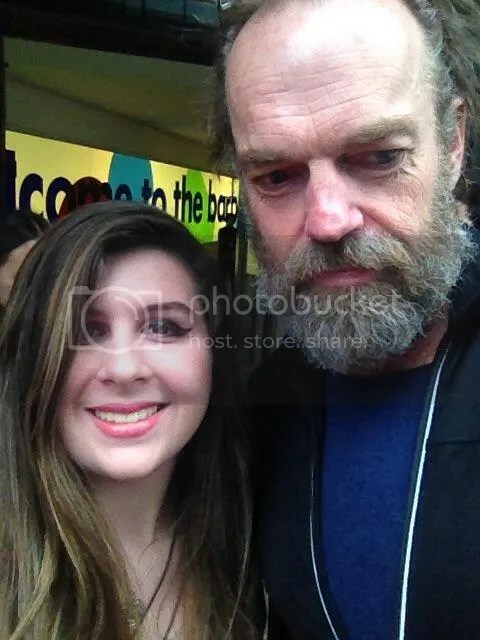 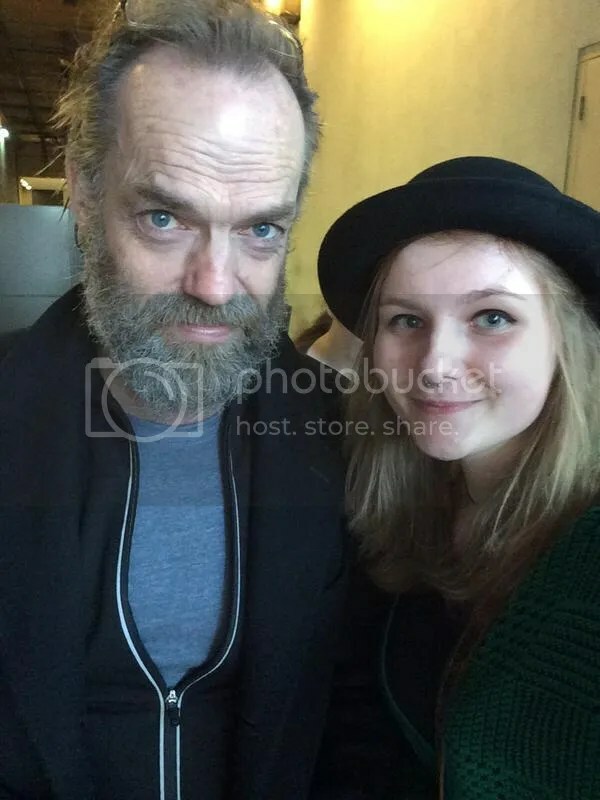 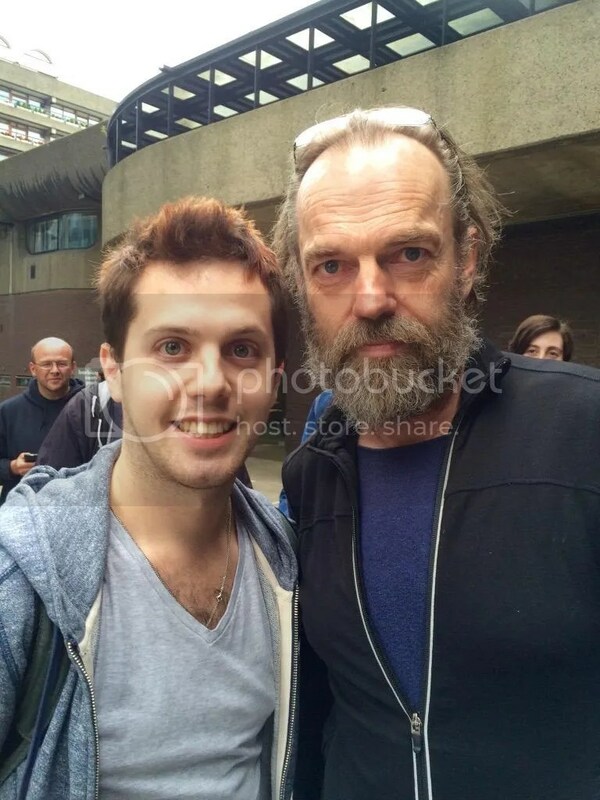 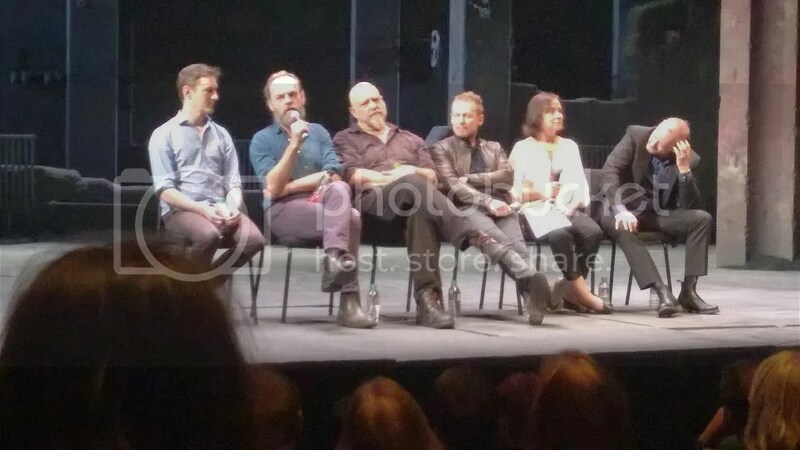 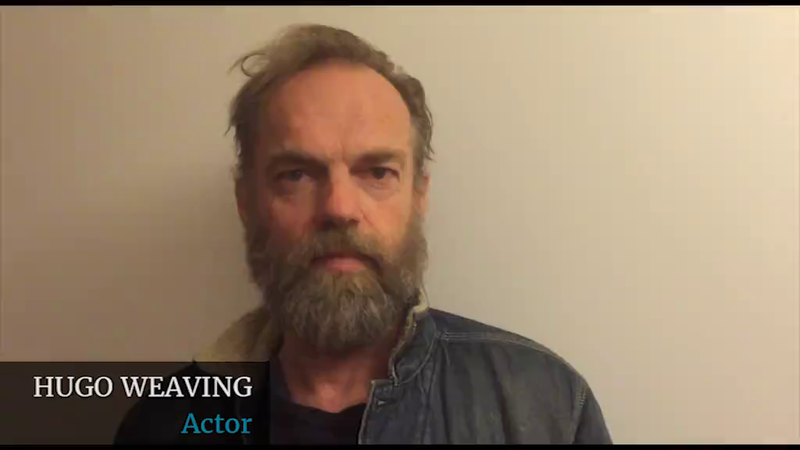 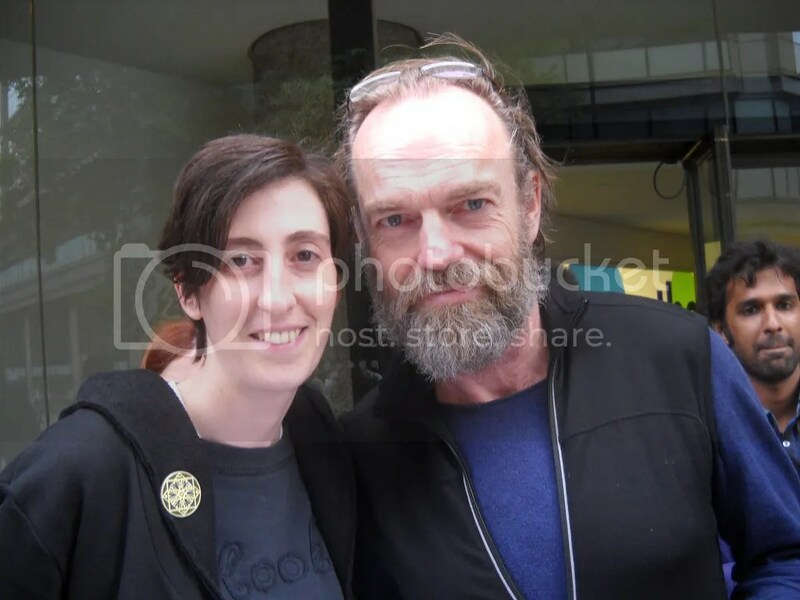 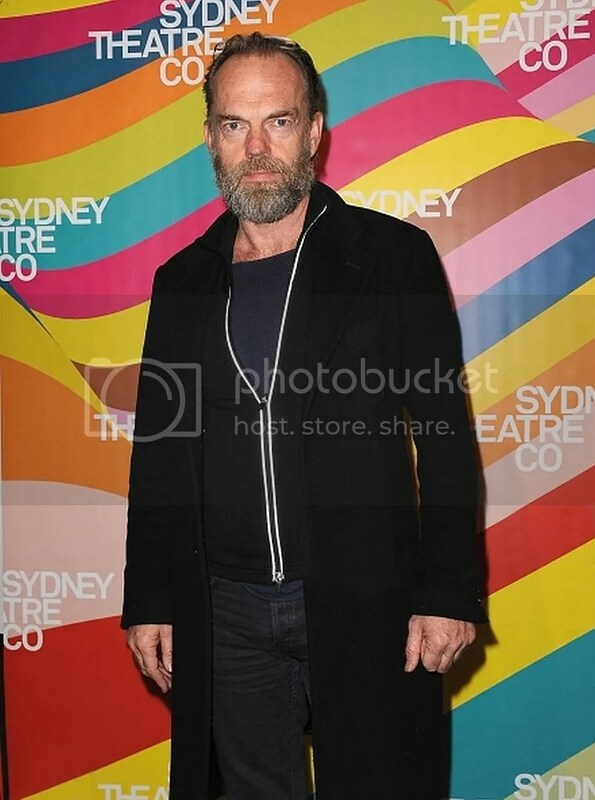 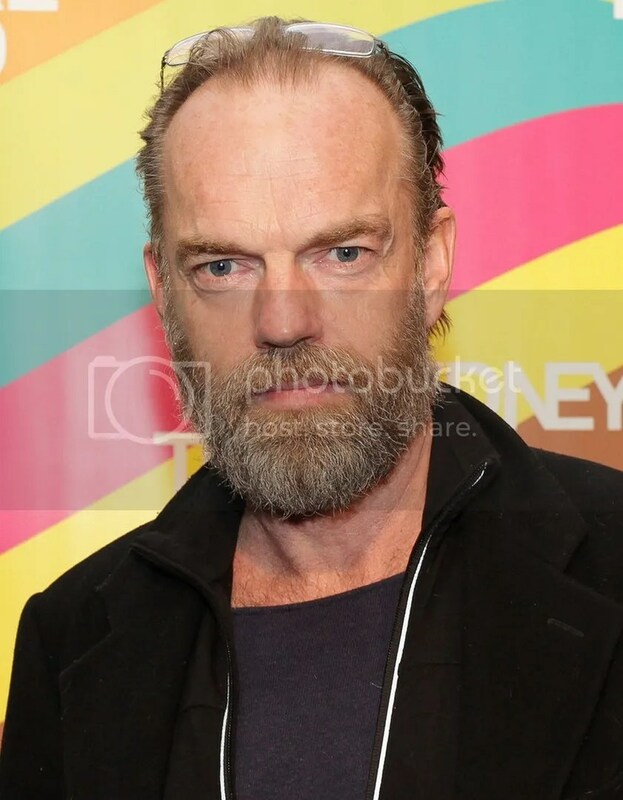 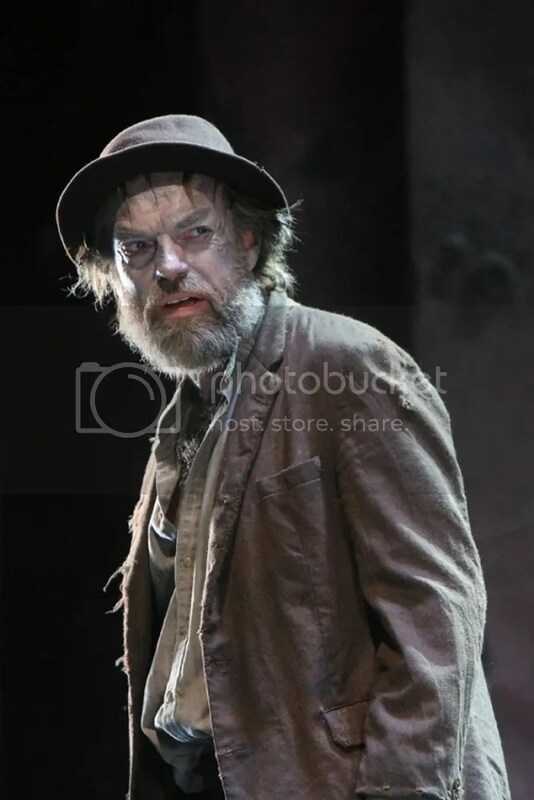 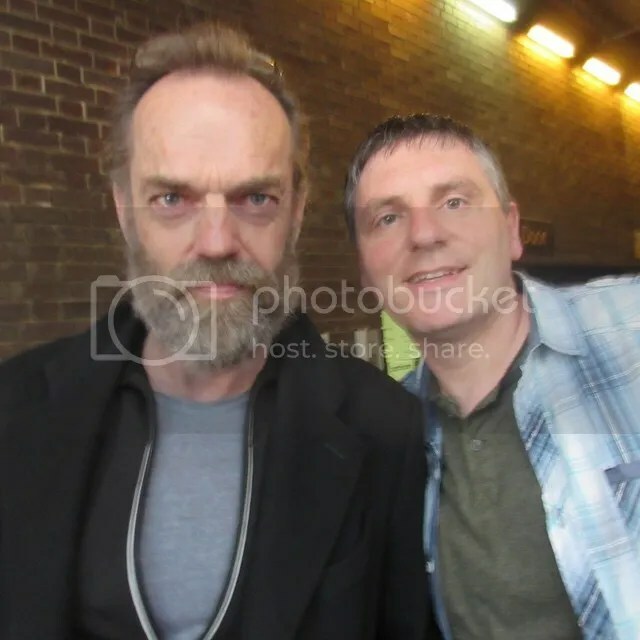 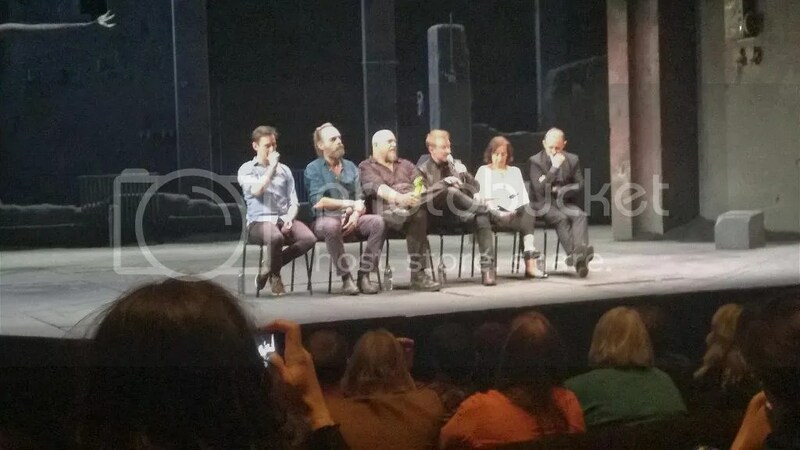 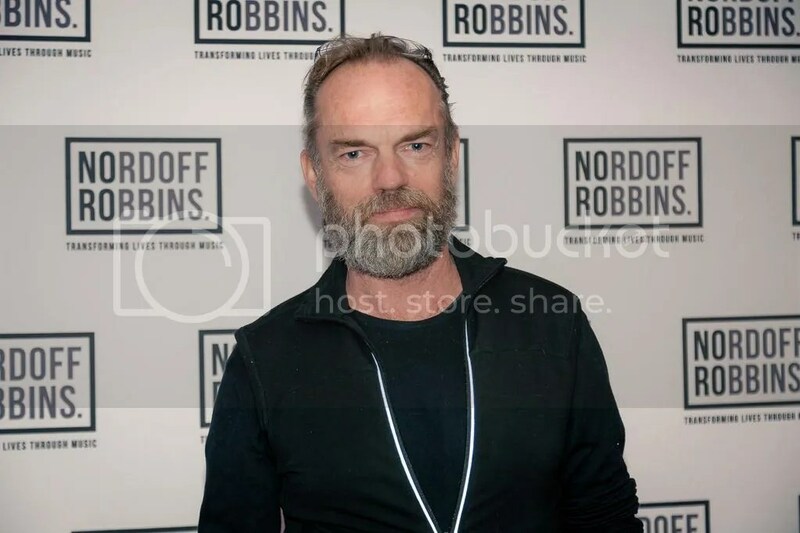 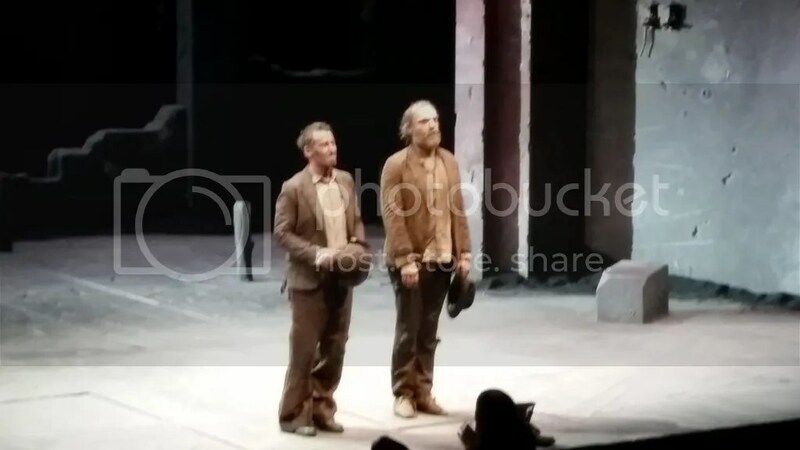 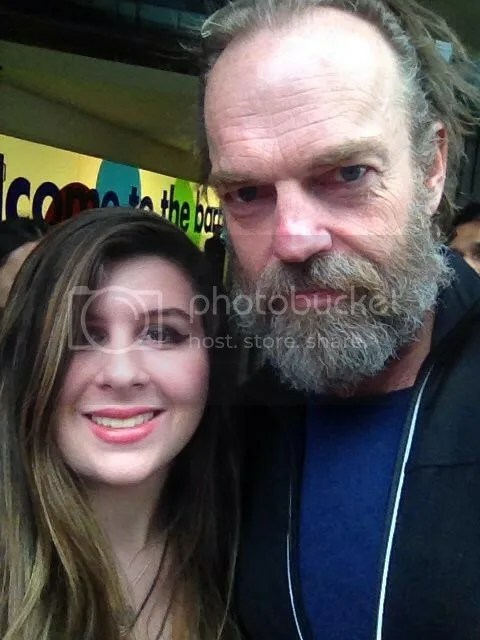 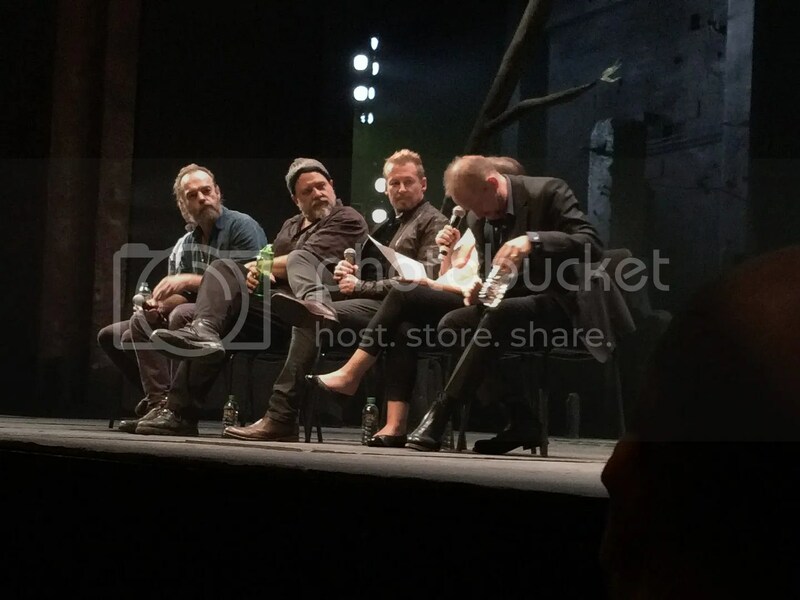 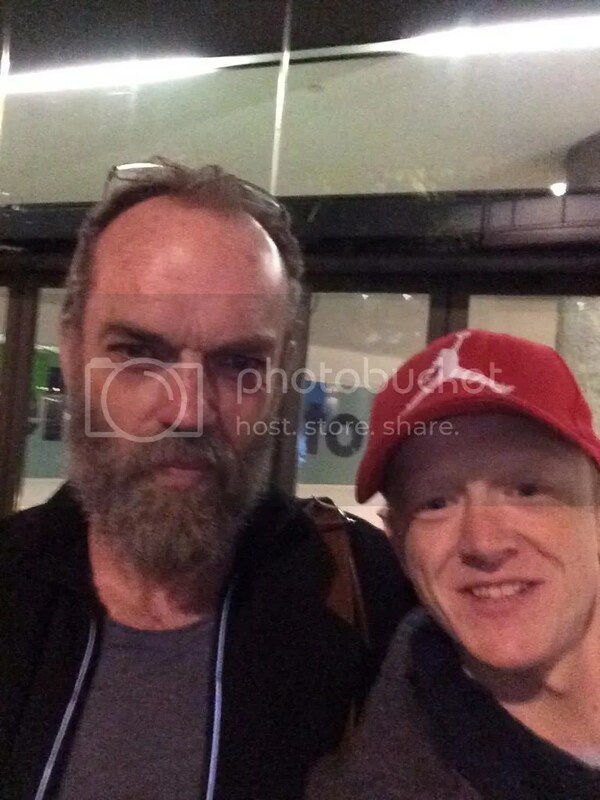 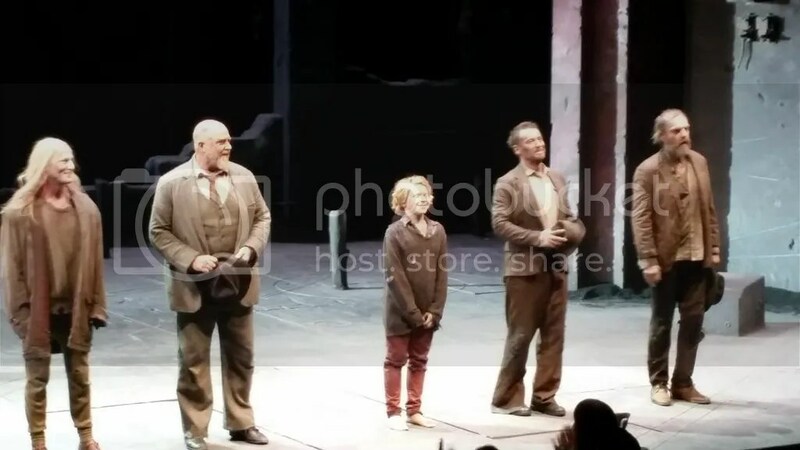 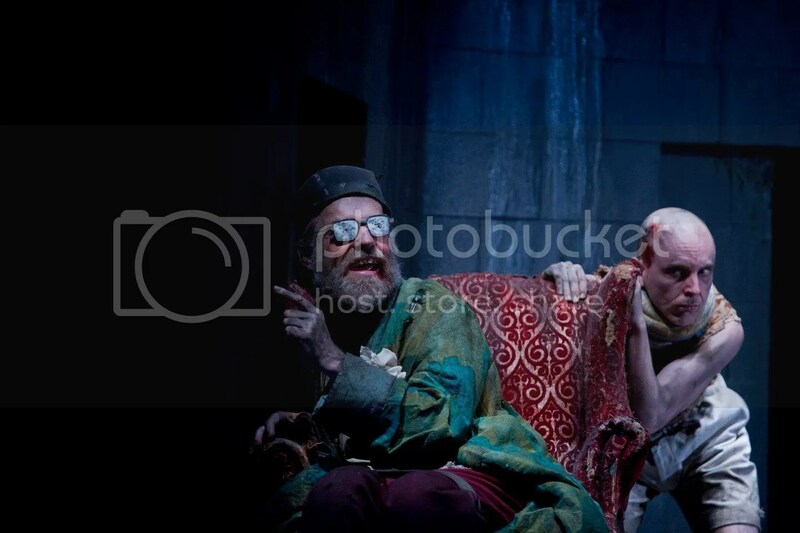 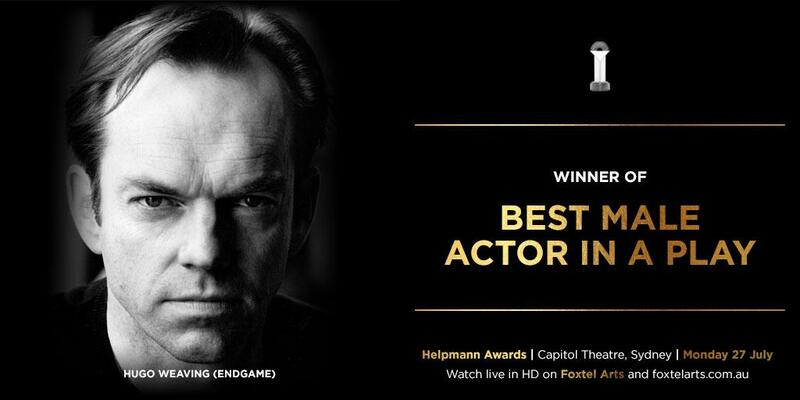 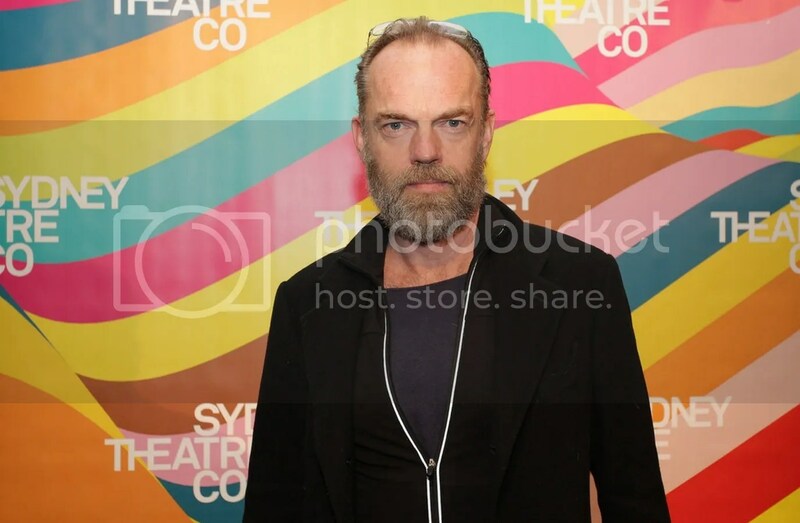 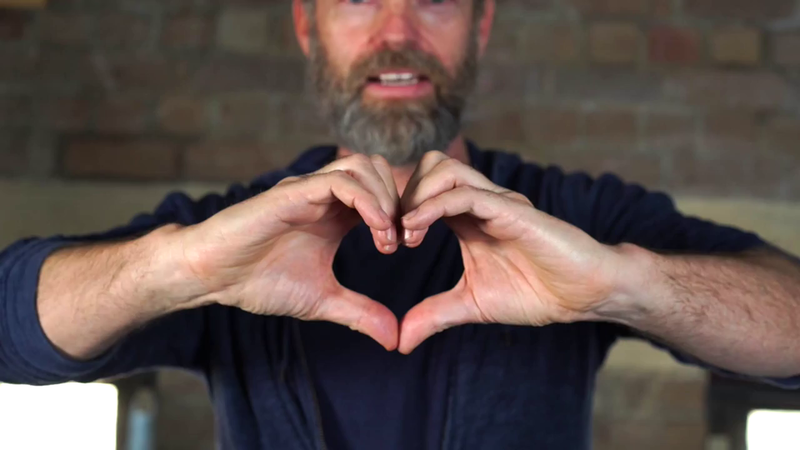 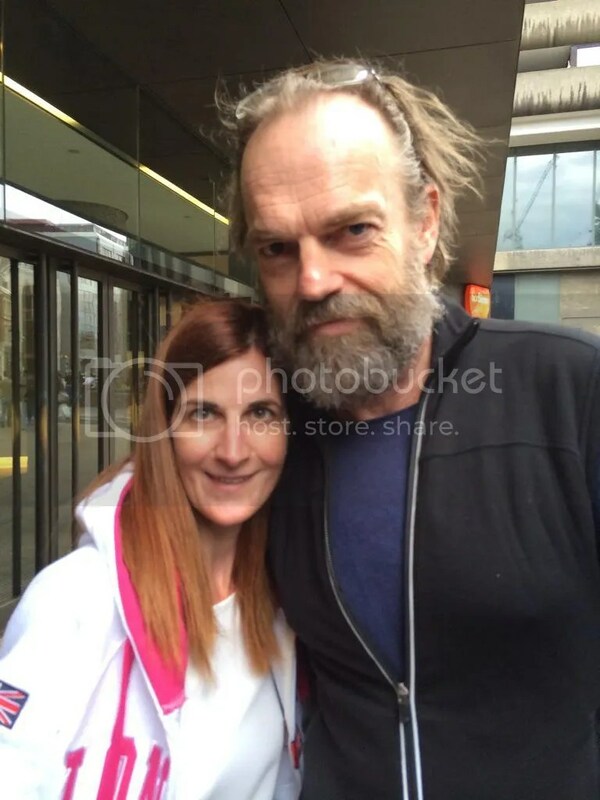 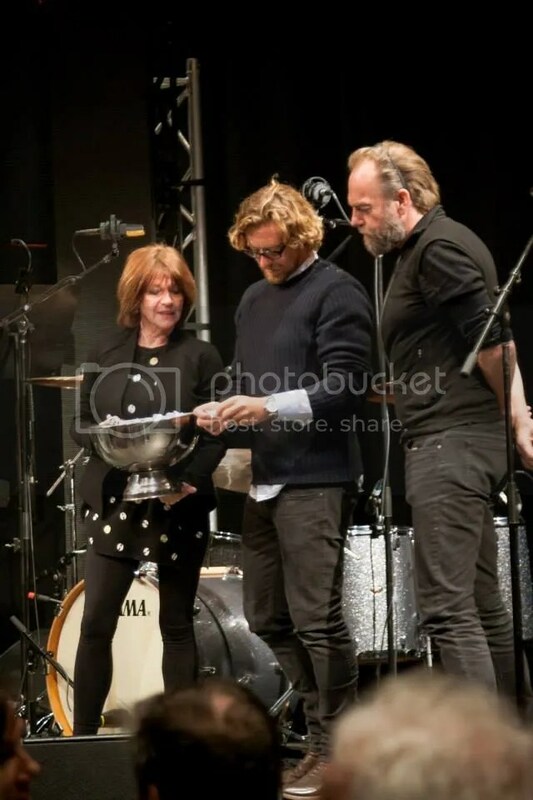 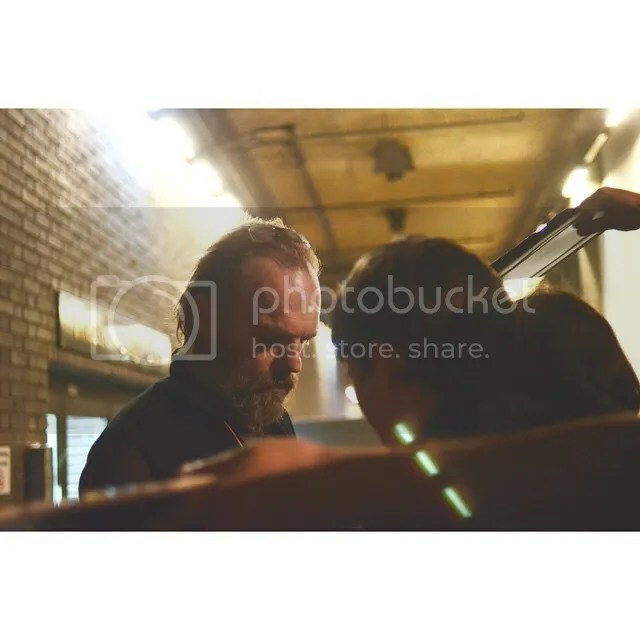 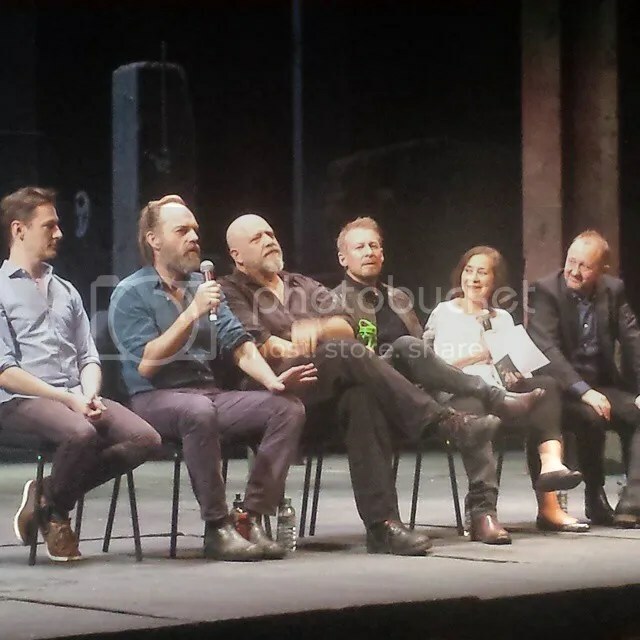 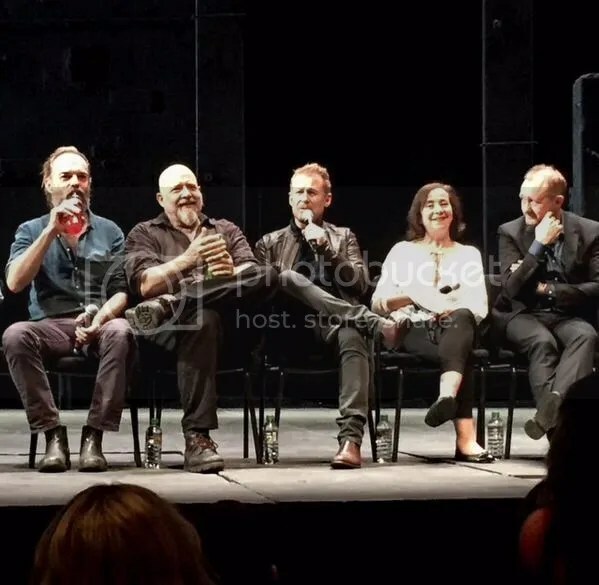 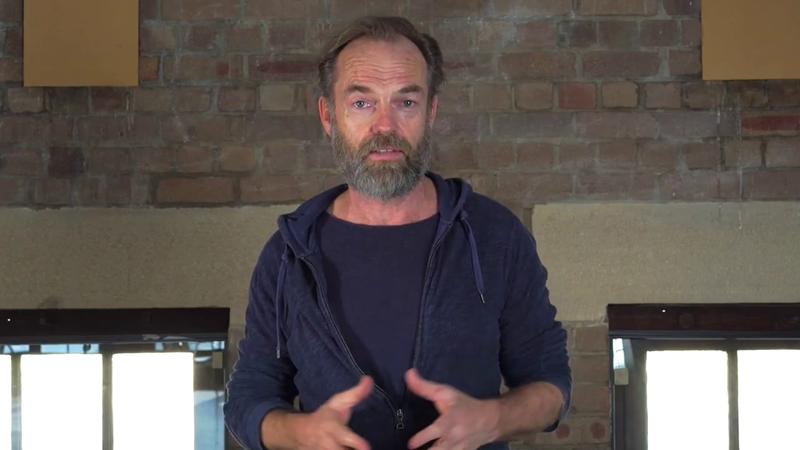 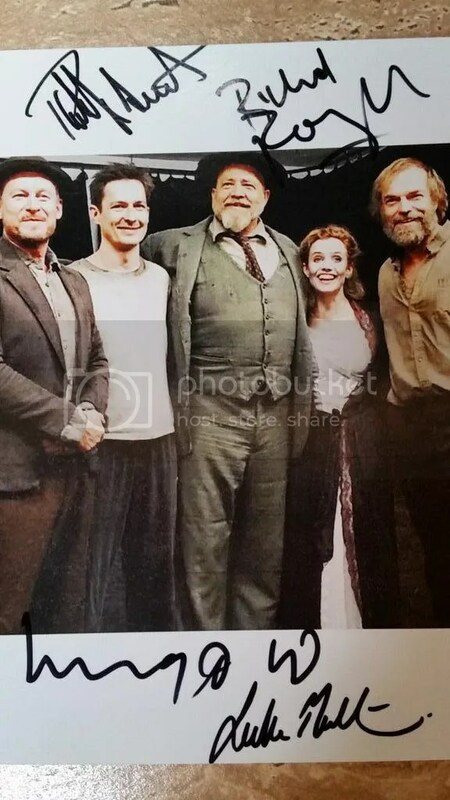 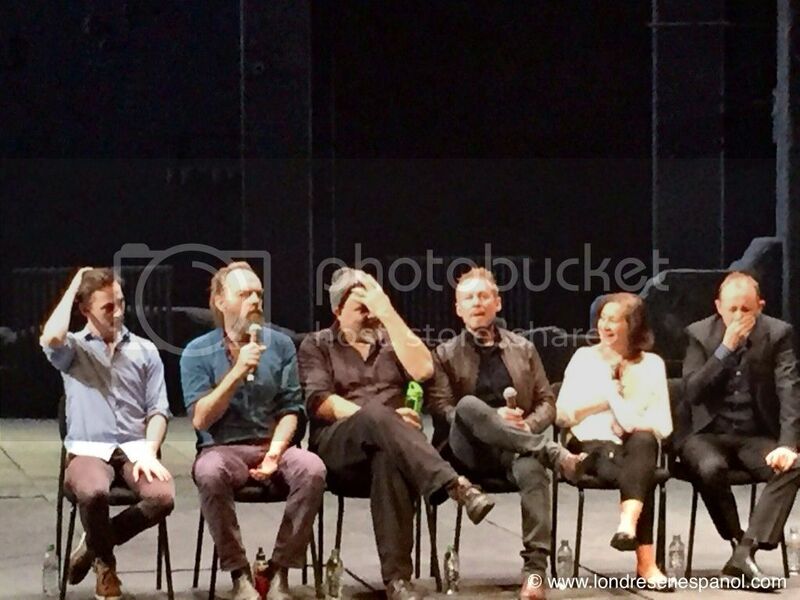 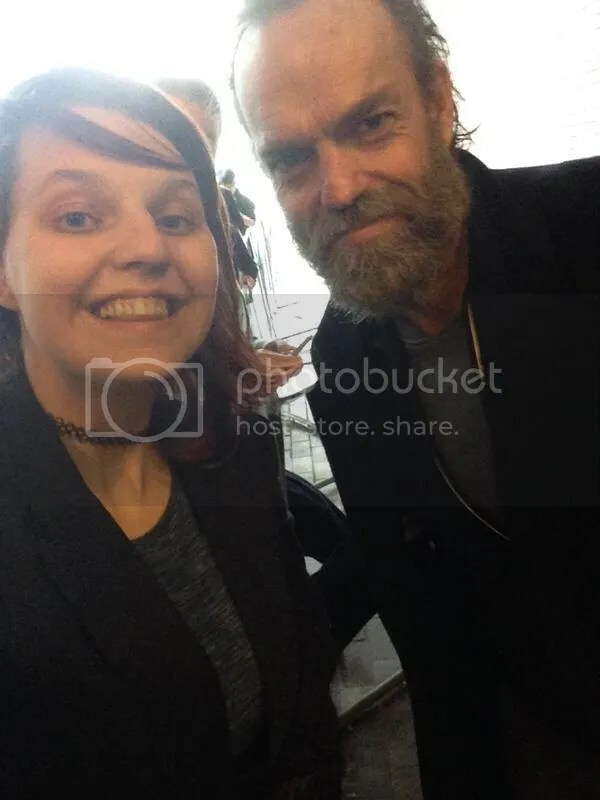 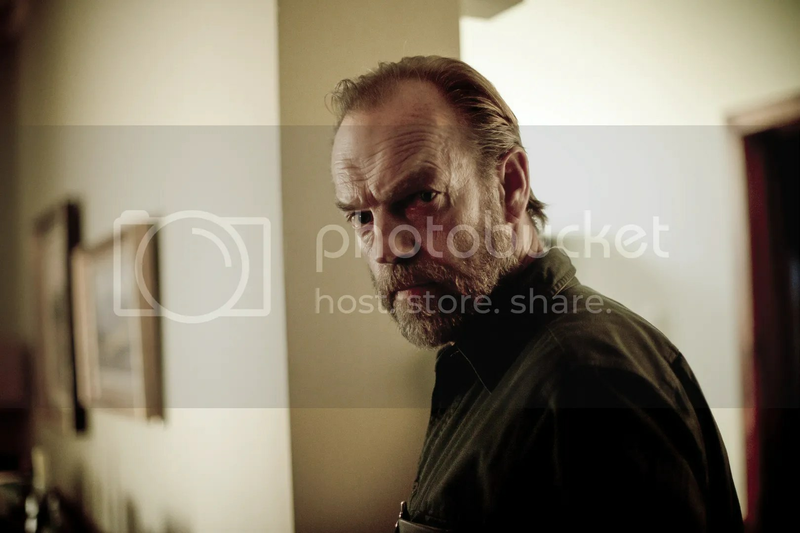 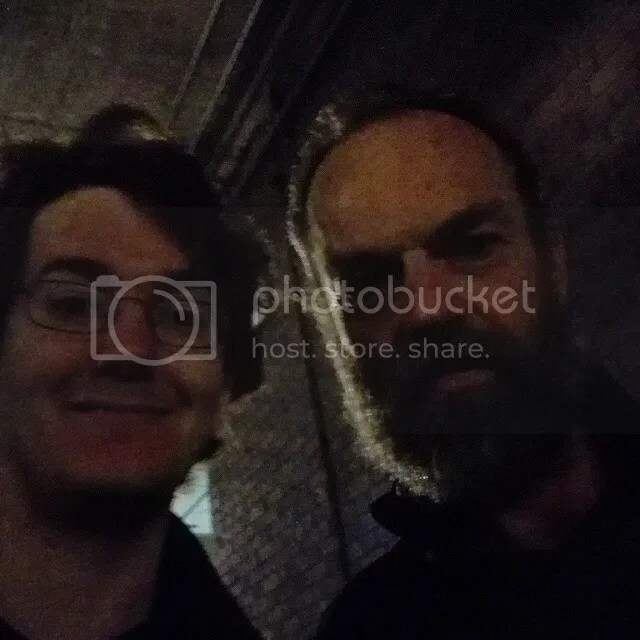 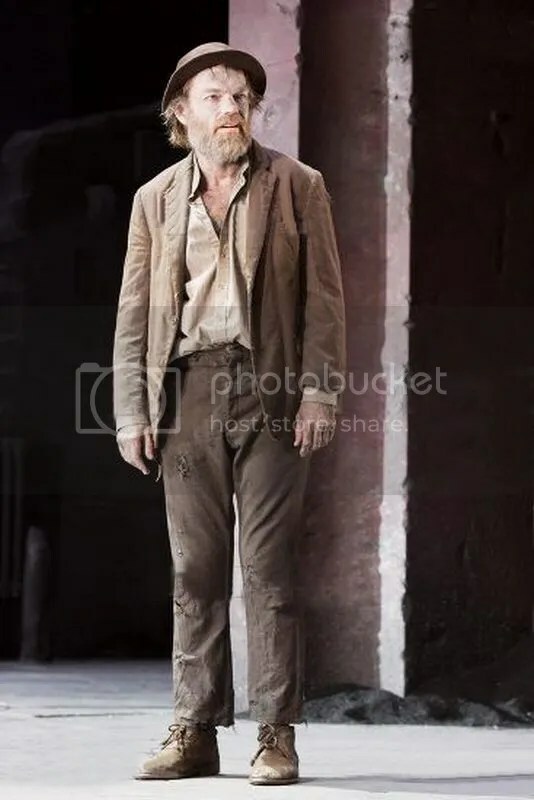 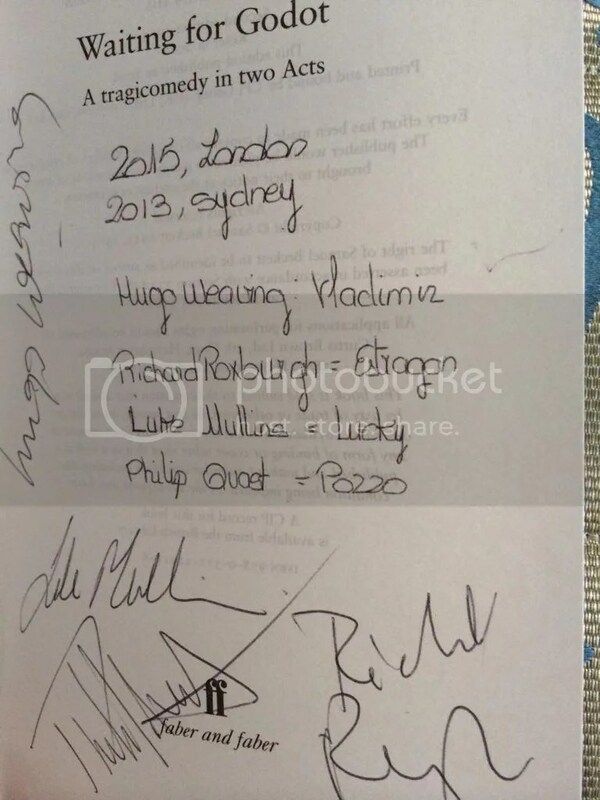 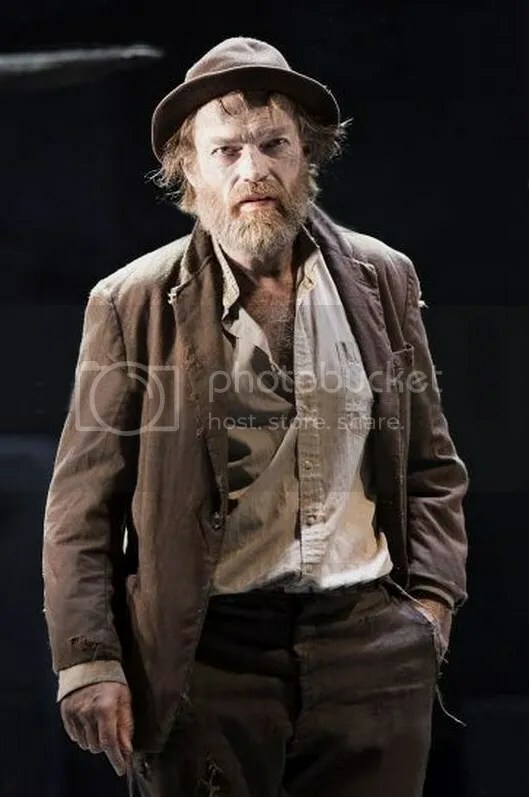 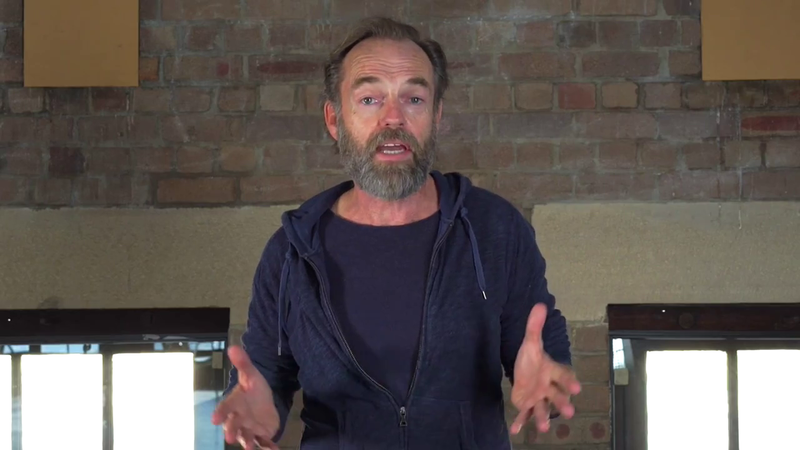 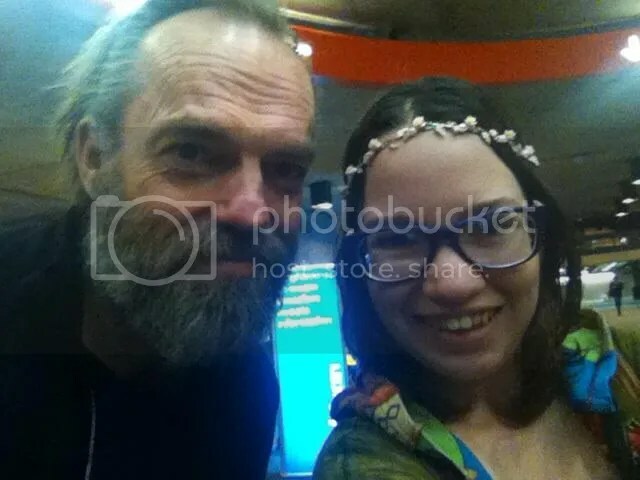 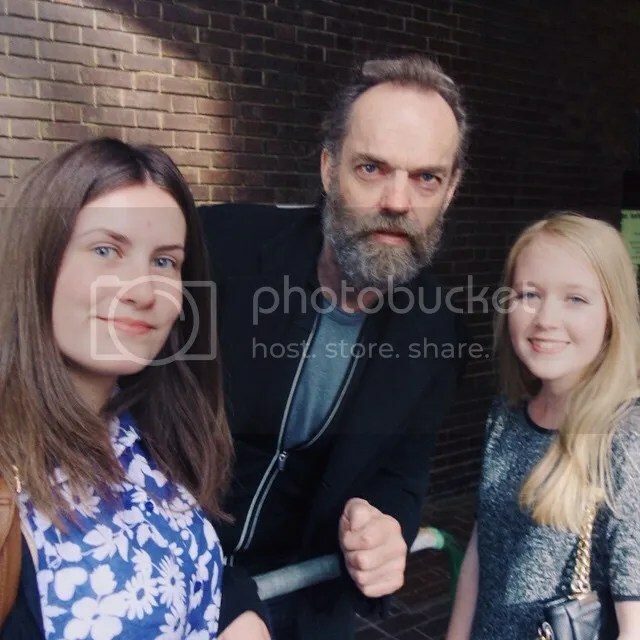 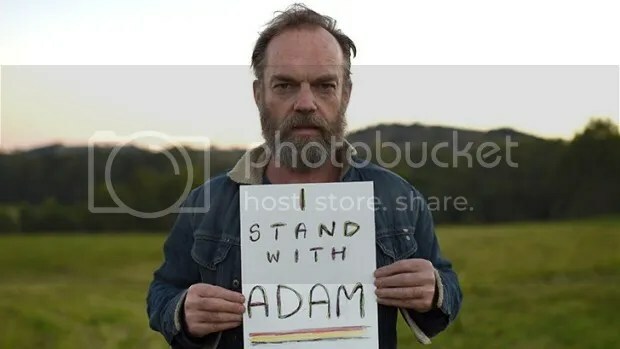 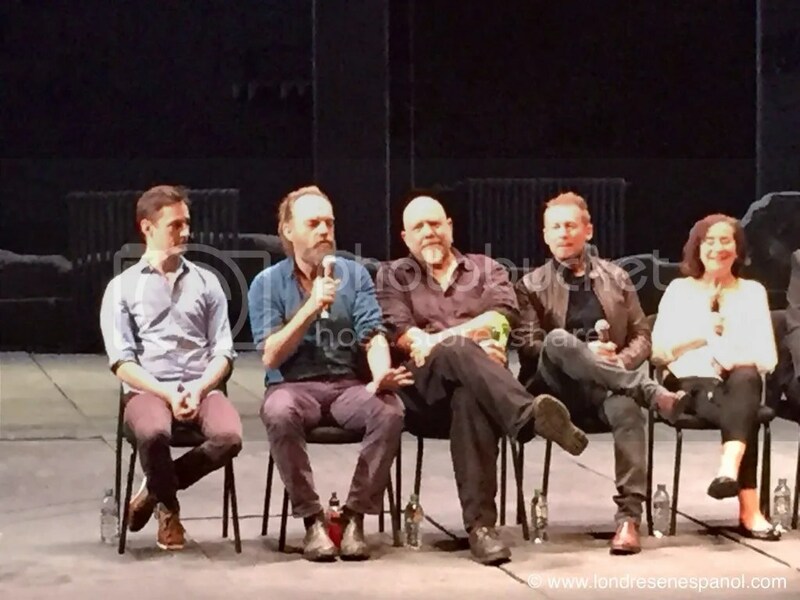 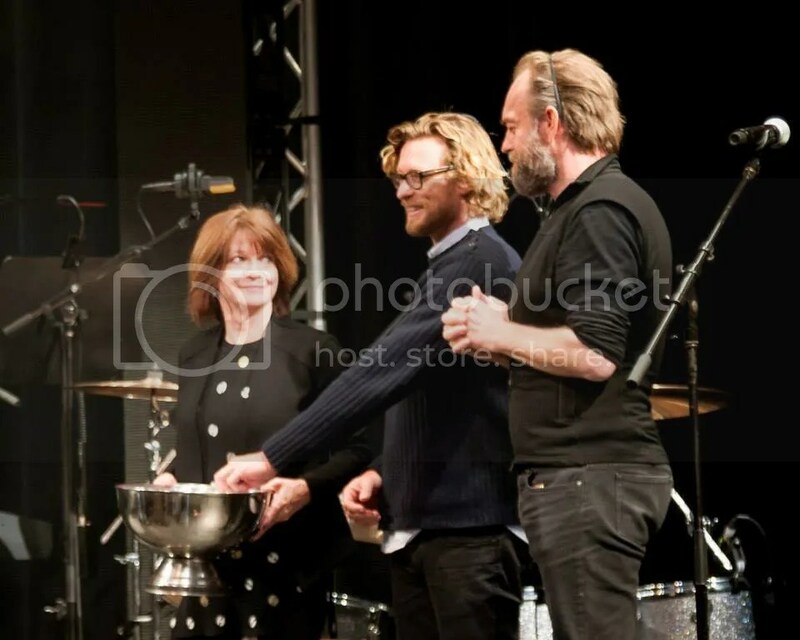 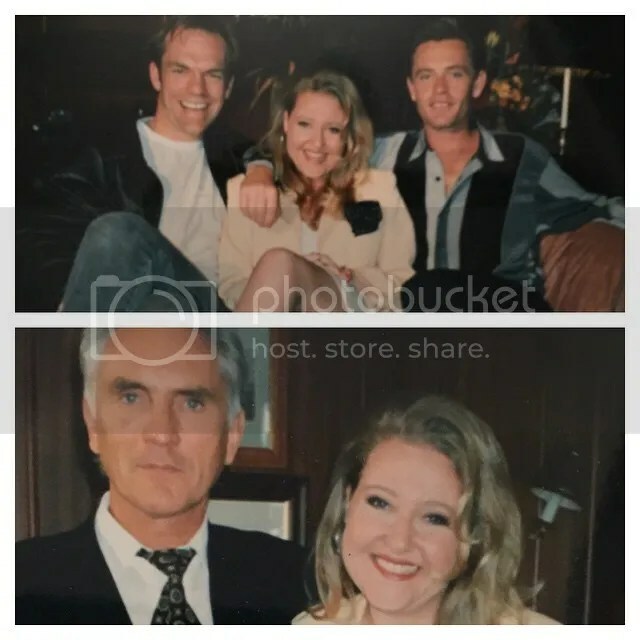 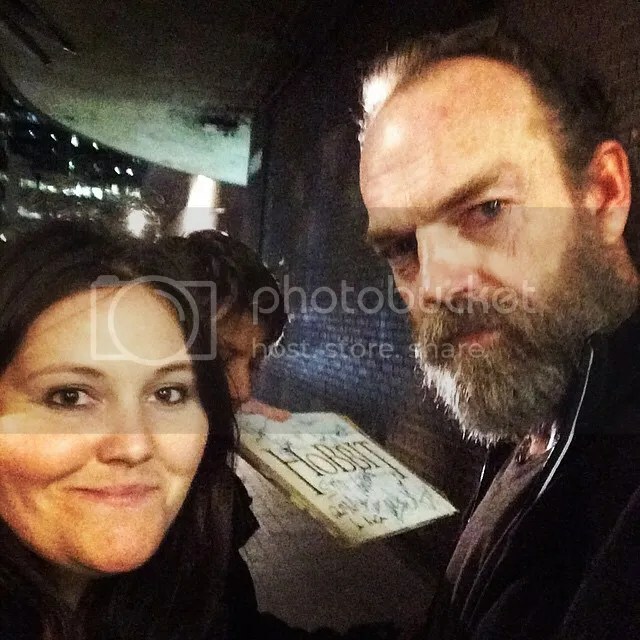 I’ll lead off with a great new interview Hugo Weaving, Richard Roxburgh and Andrew Upton did for The Sydney Morning Herald, then intersperse review excerpts with the wealth of fan and professional photos of the new productions. 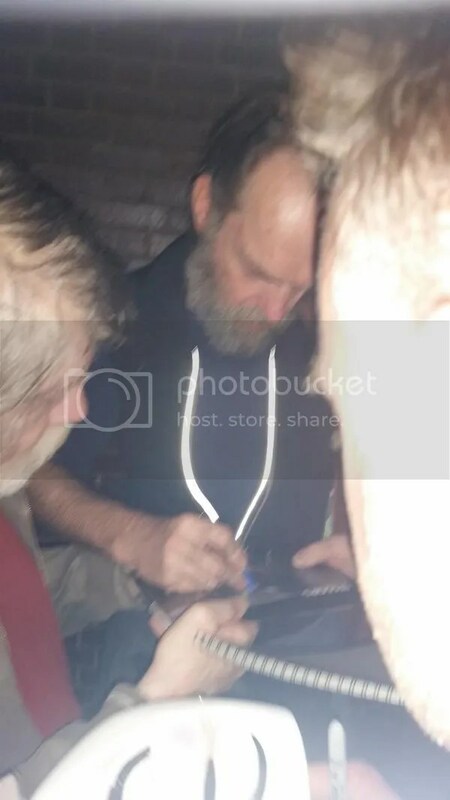 There WILL be additional photos in days to come, but some aren’t ready to share yet. 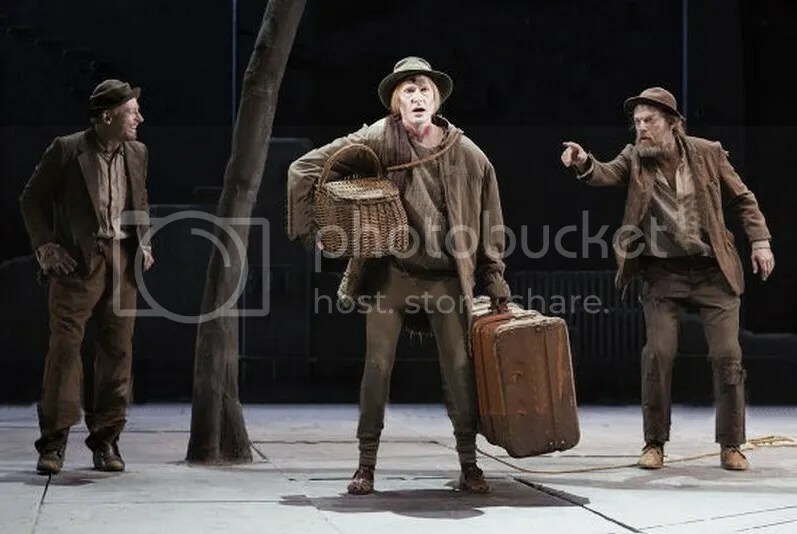 This is the print version of the Sydney Morning Herald piece, which finds Weaving and Roxburgh exchanging impressions of the play, and how it’s evolved between the Sydney and London stagings. 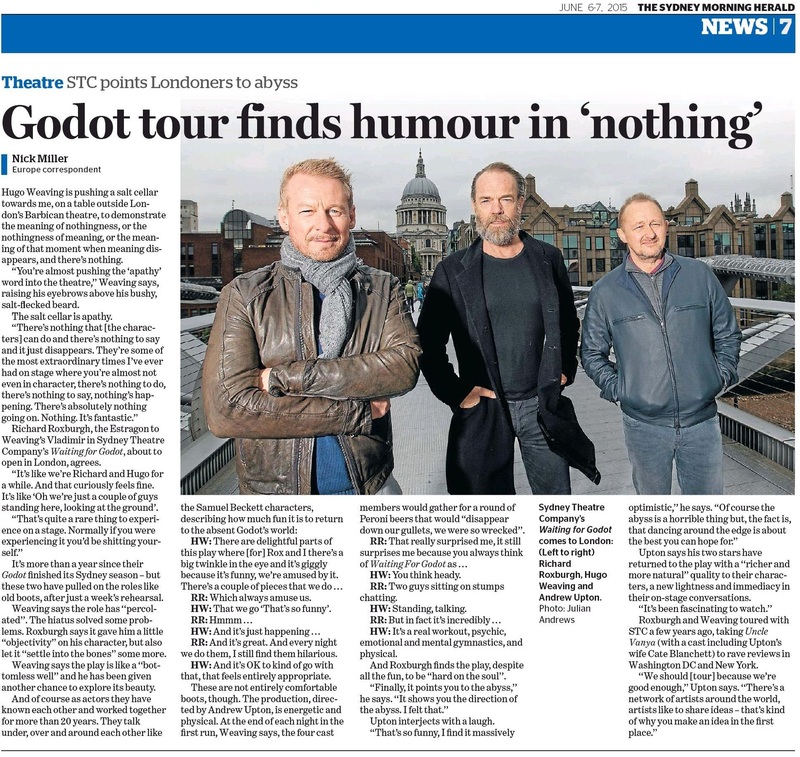 Andrew Upton makes some hopeful noise about future touring for the STC, but holds out on any specifics. 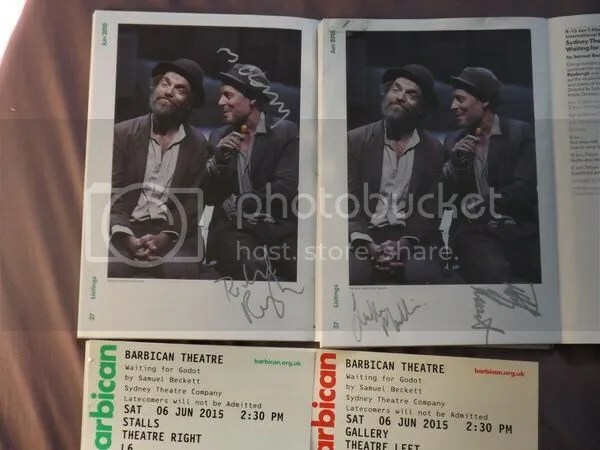 😉 You can read the identical online version here. 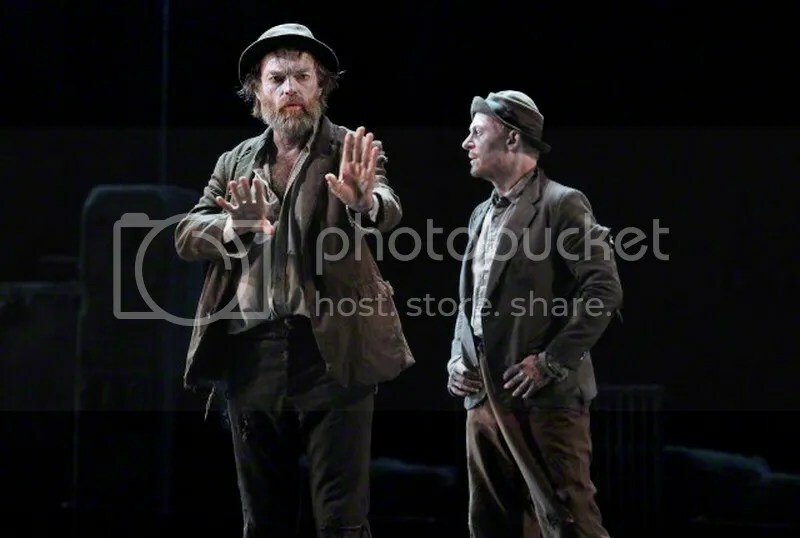 The amazing photo in both versions is by Julian Andrews. 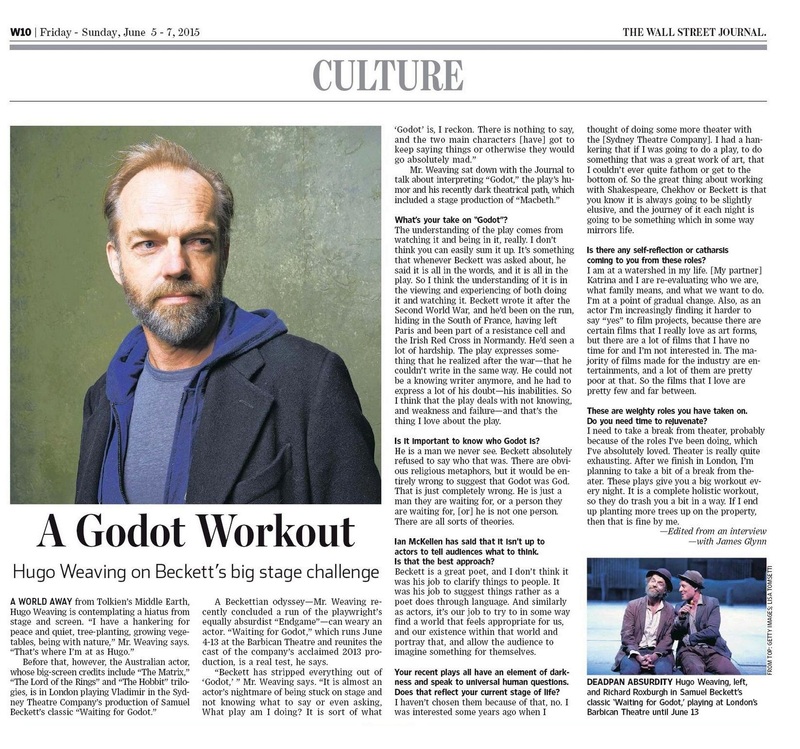 I’ve also added print scans of Hugo Weaving’s Wall Street Journal interview from June 4 and David Stratton’s review of Strangerland from The Australian to my Hugo Weaving Flickr archive…both are very similar to the online versions previously shared. 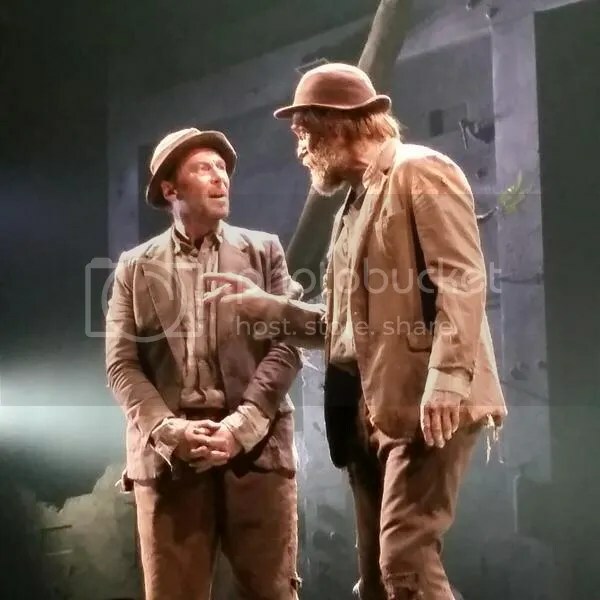 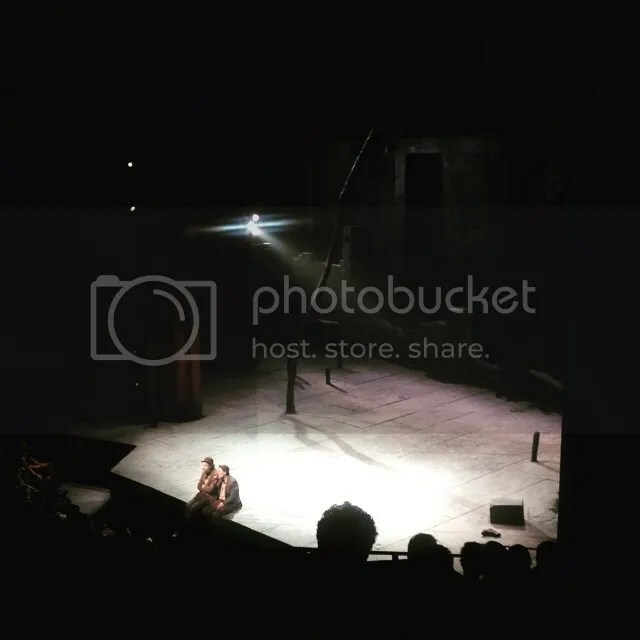 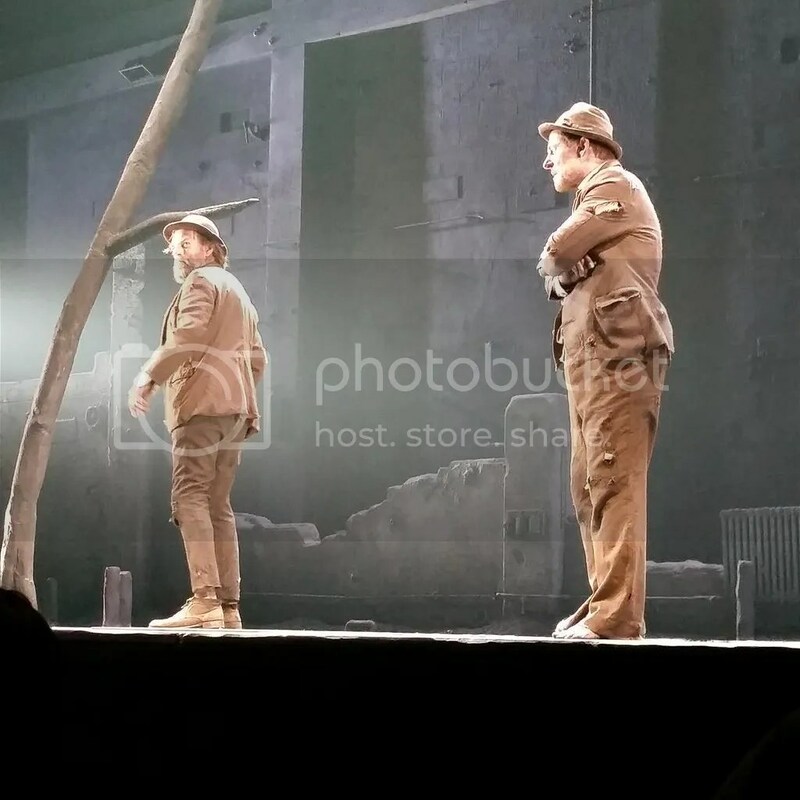 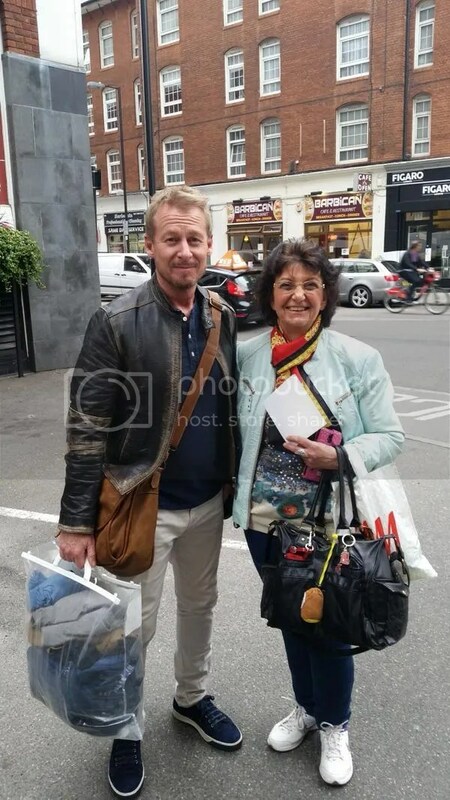 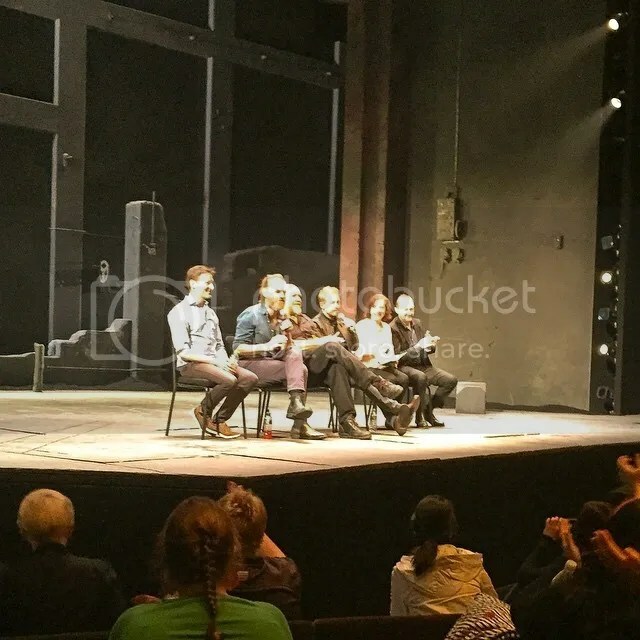 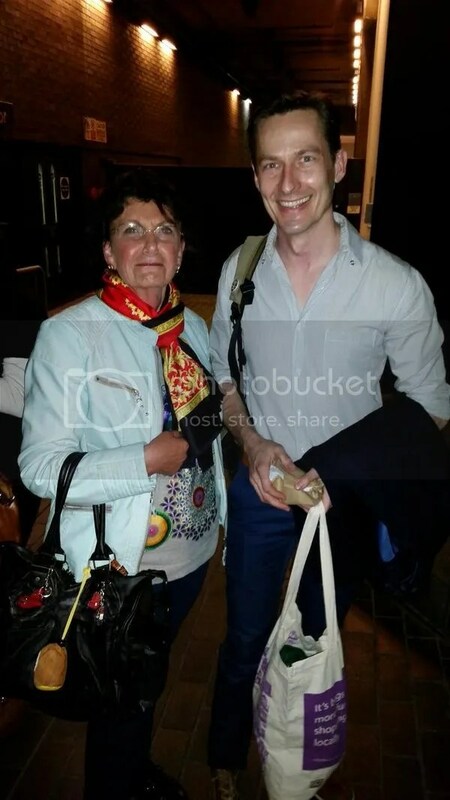 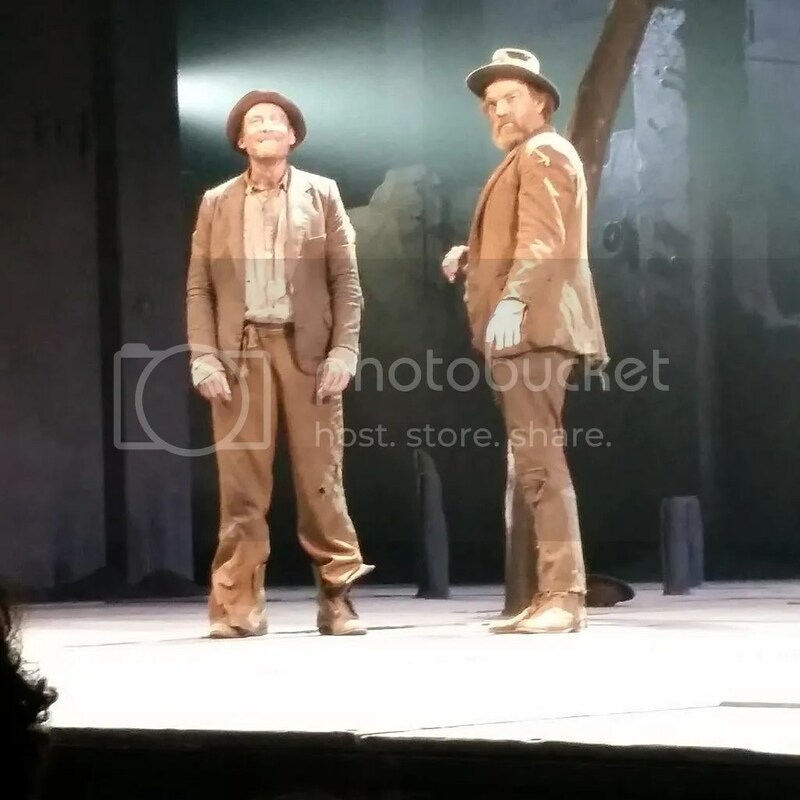 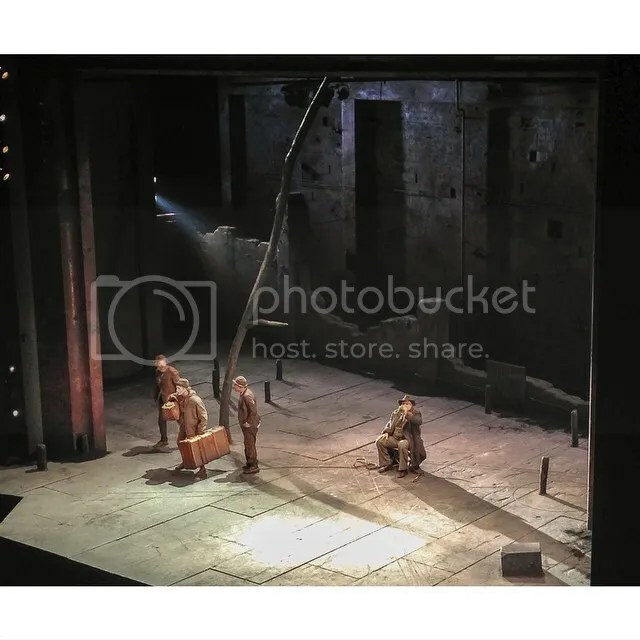 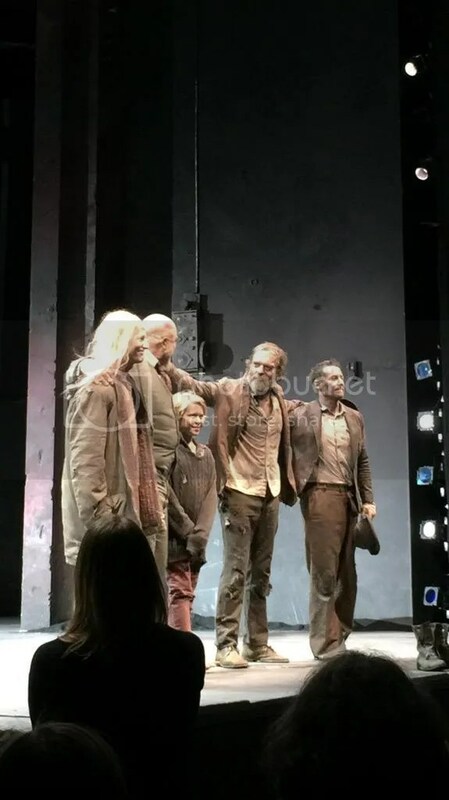 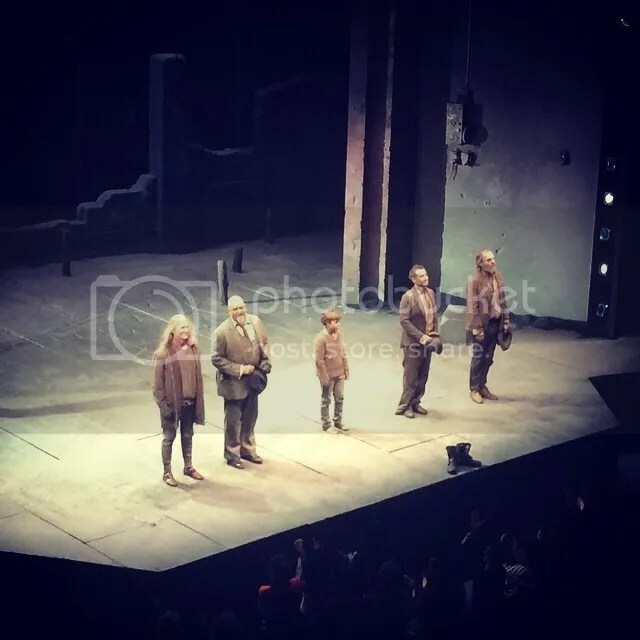 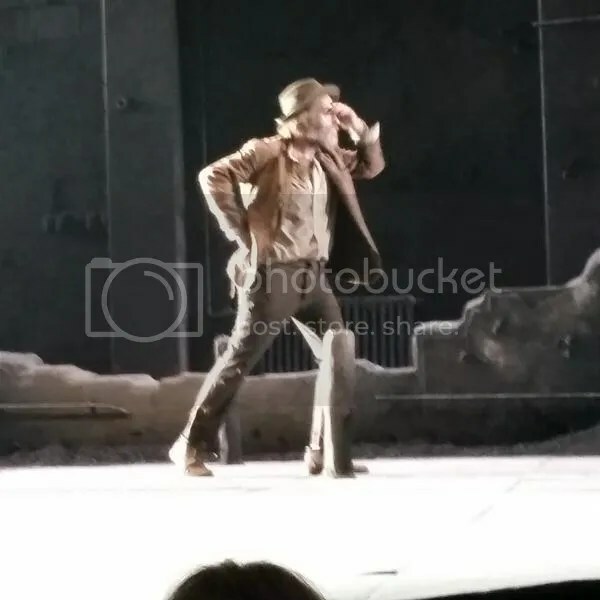 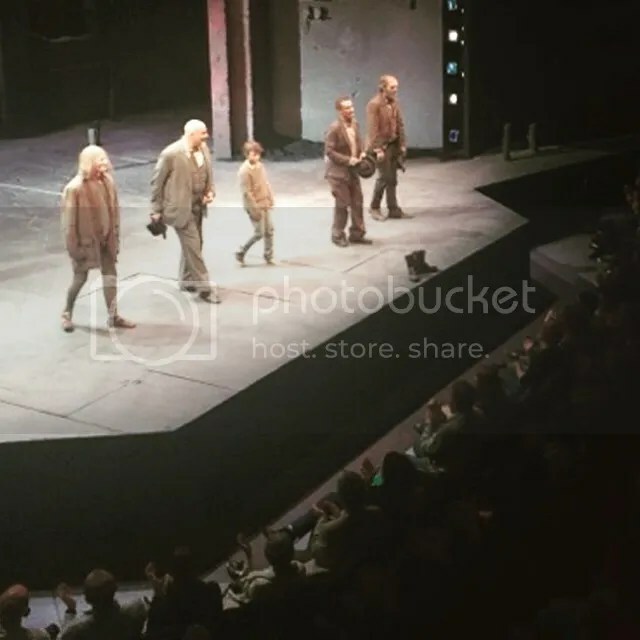 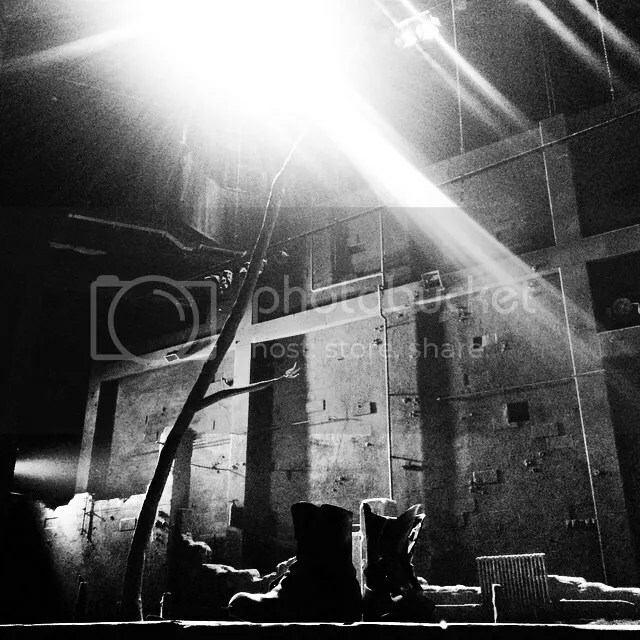 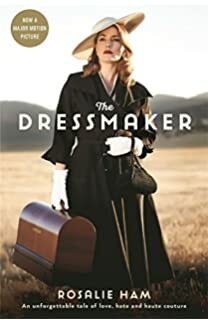 Here are an assortment of new production photos, fan/stage door photos and review excerpts; as always, the reviews are well worth reading in their entirety, so I’ve linked back to the sites of origin. 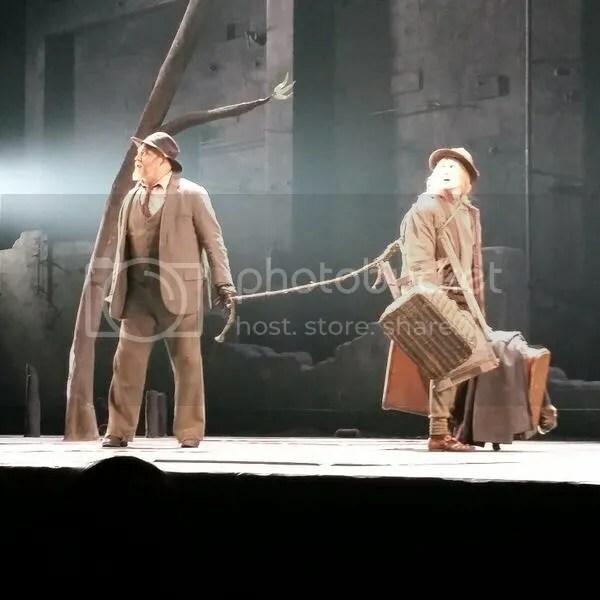 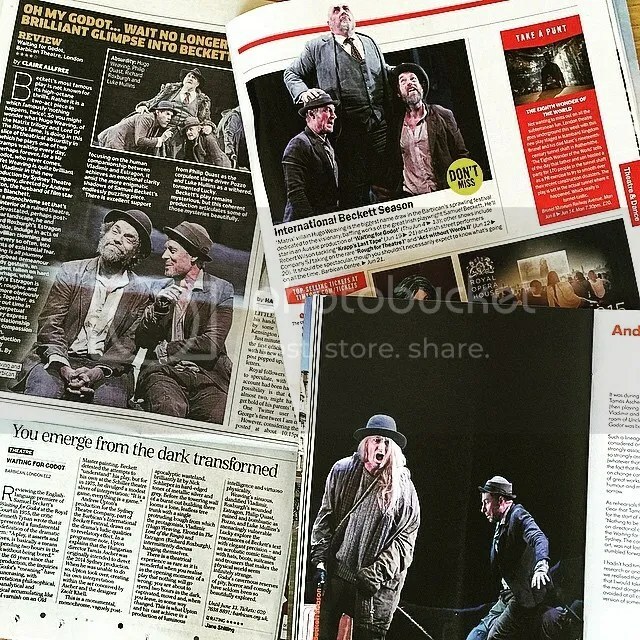 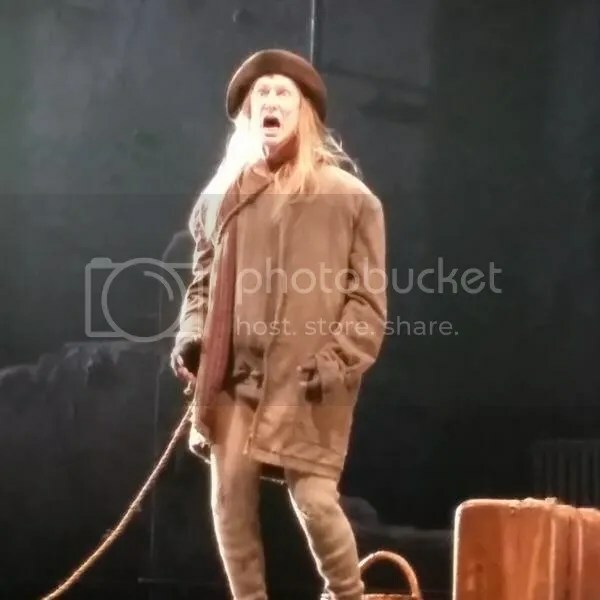 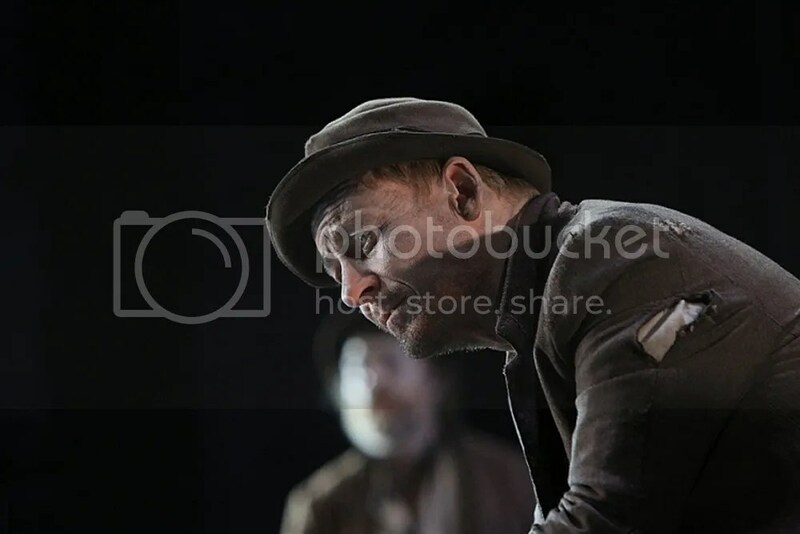 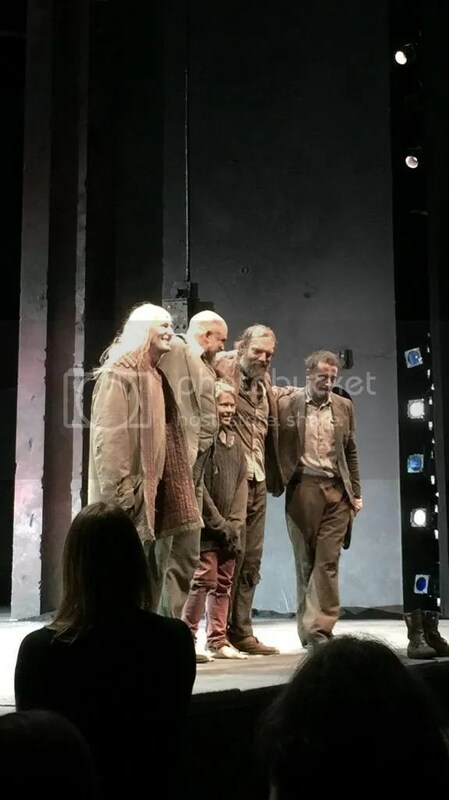 Jane Schilling, The Daily Telegraph: “Andrew Upton’s production for the Sydney Theatre Company, part of the Barbican’s International Beckett Festival, draws on the drama’s ludic qualities to revelatory effect…. 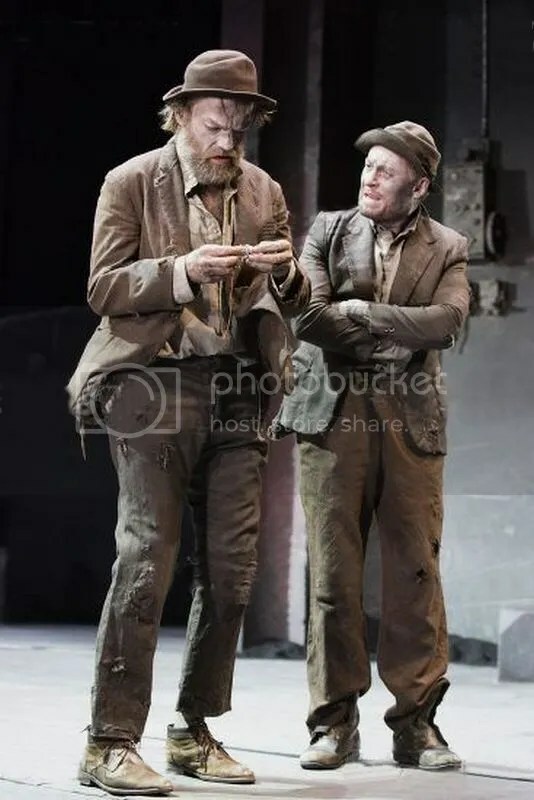 The comic performances are brilliantly ridiculous in their physicality, at times outlandish while at others as subtle as a glance or a look. 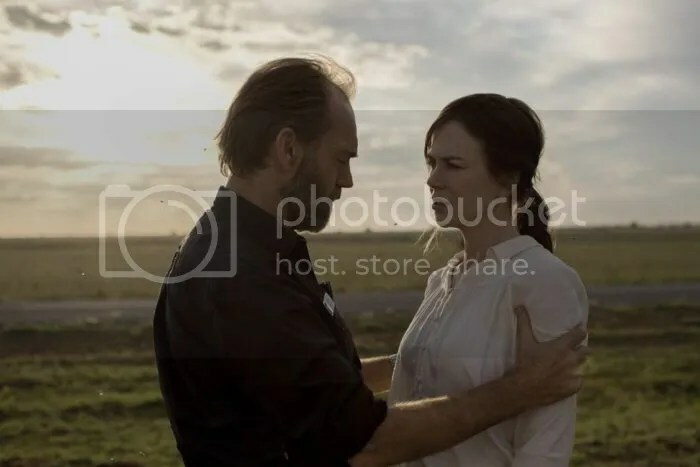 But it never loses the pathos and its heart and it is in those moments that you really feel like a mirror is being held up. 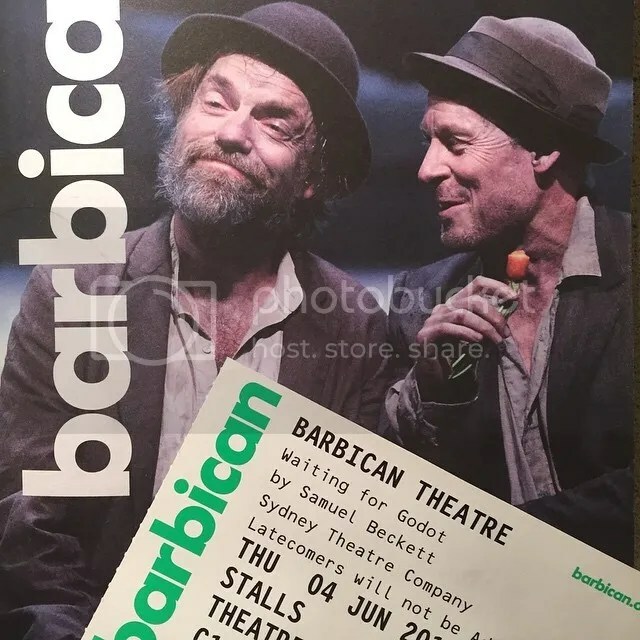 It a very personal play, one in which you will interpret and reconcile its themes in your own way while being thoroughly entertaining. 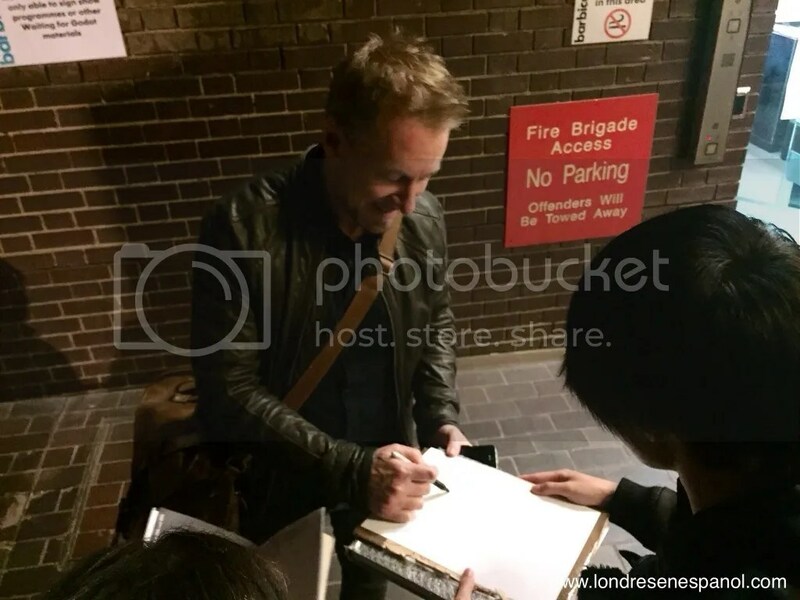 Yo can read an interview with Richard Roxburgh, who also discusses his popular series Rake at Yahoo7. 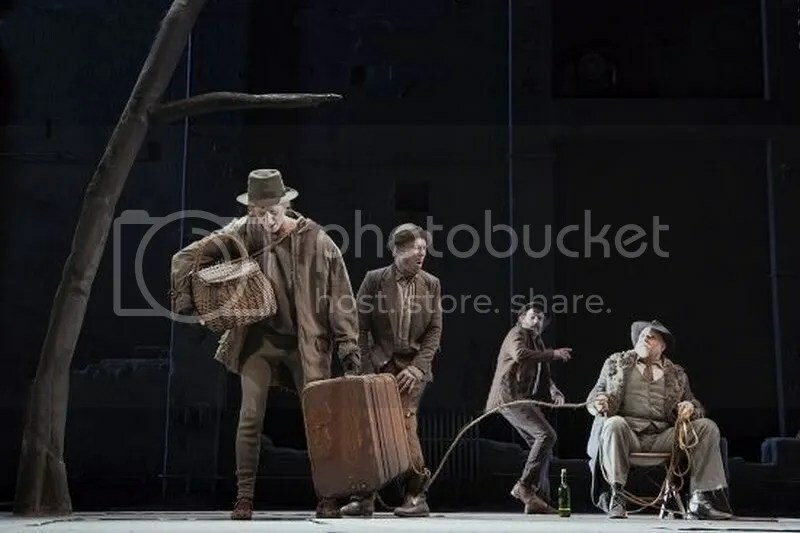 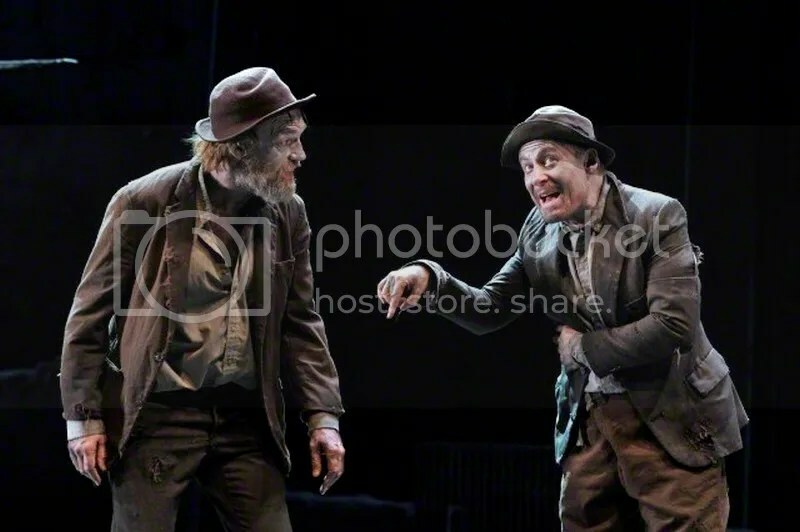 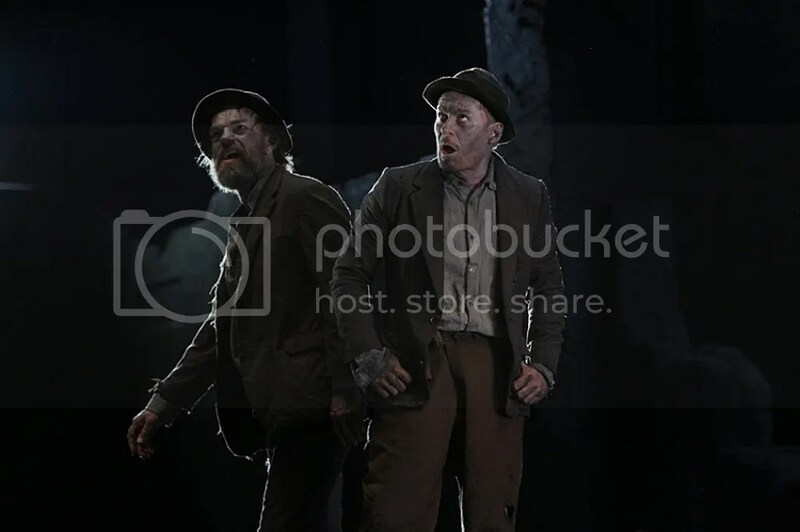 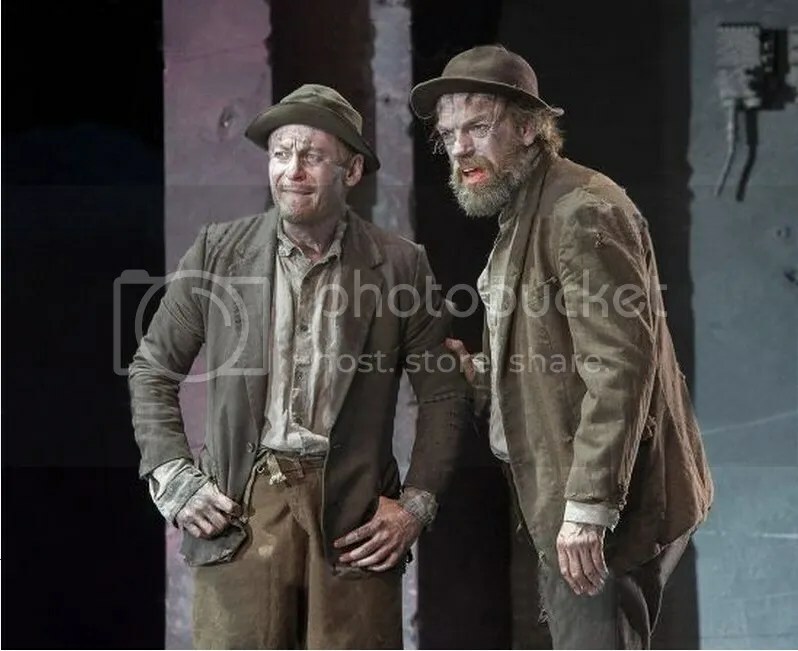 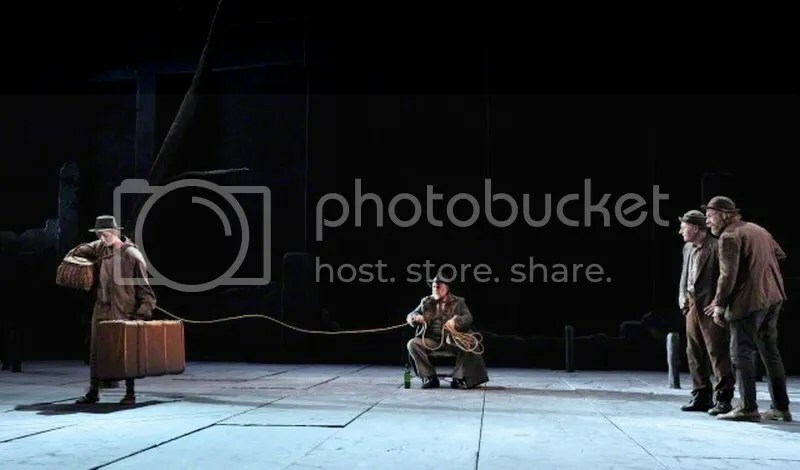 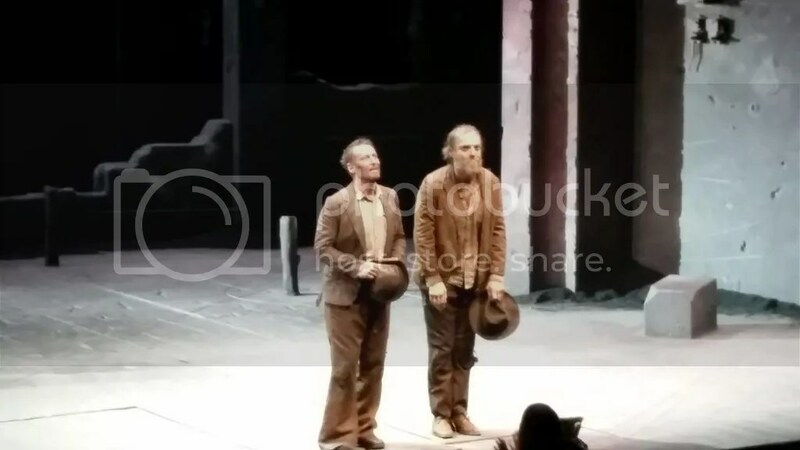 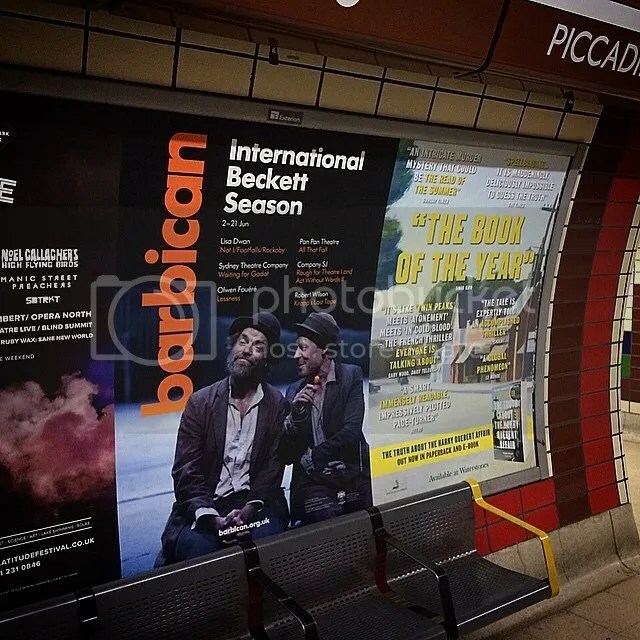 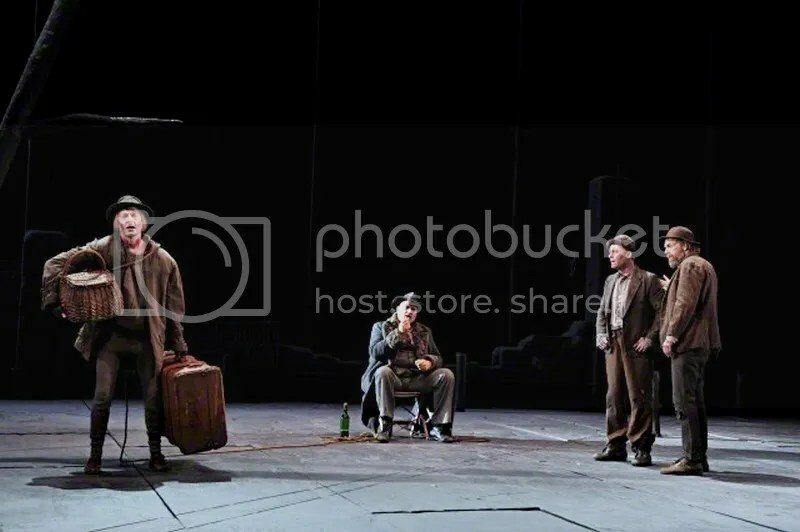 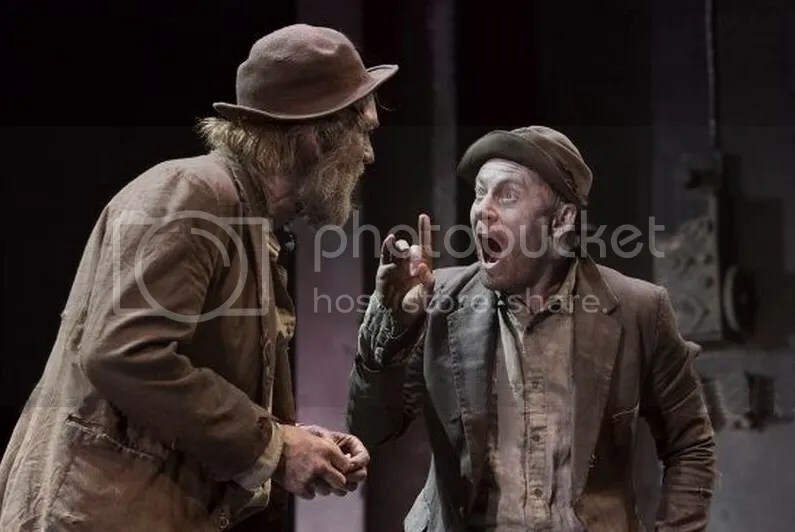 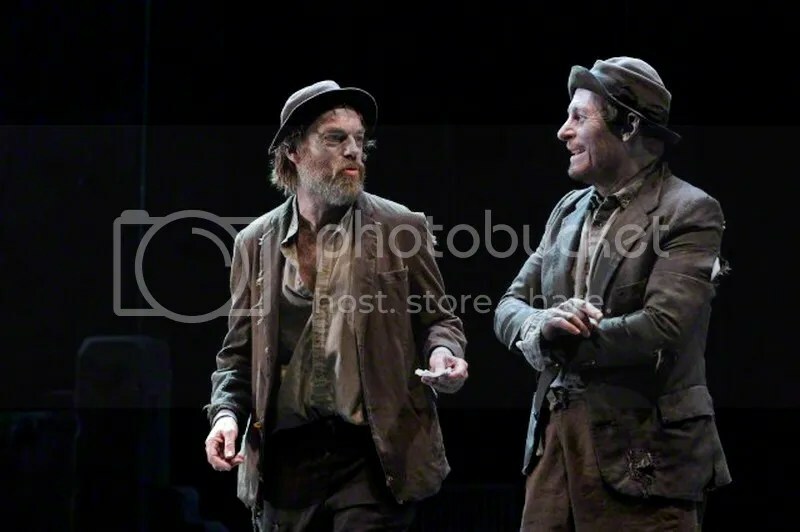 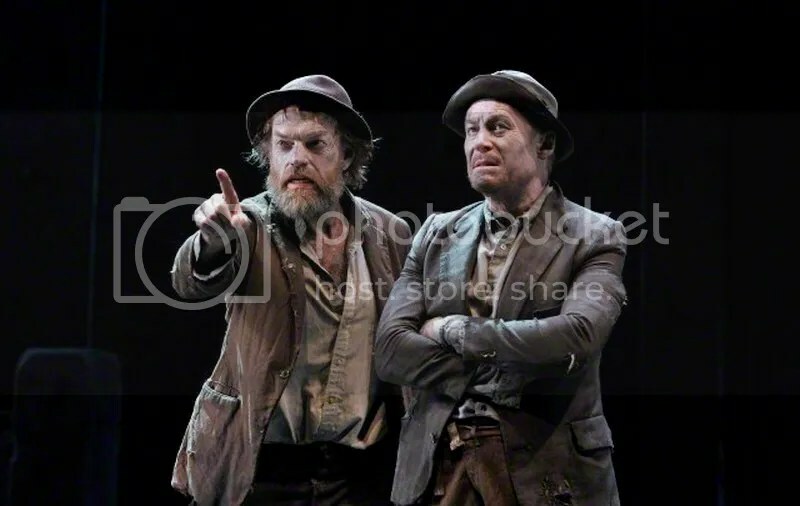 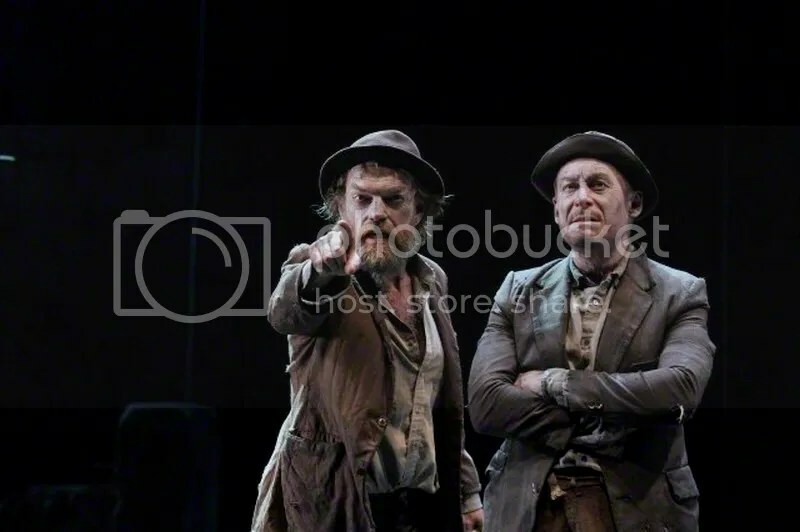 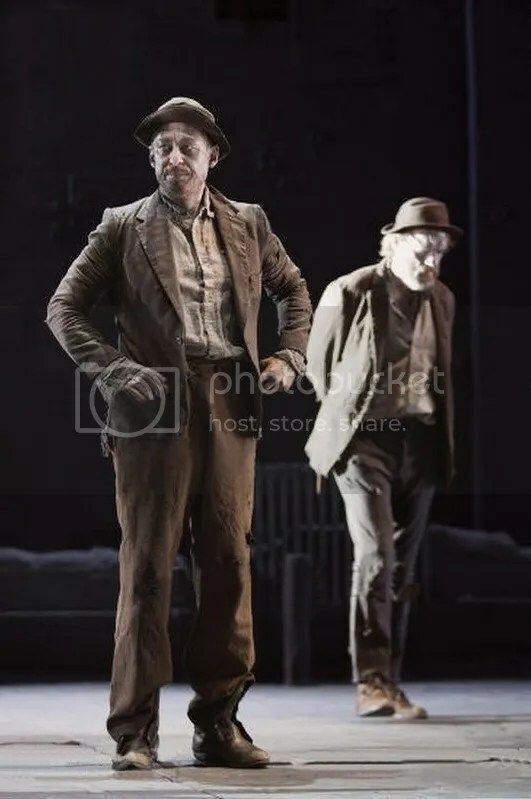 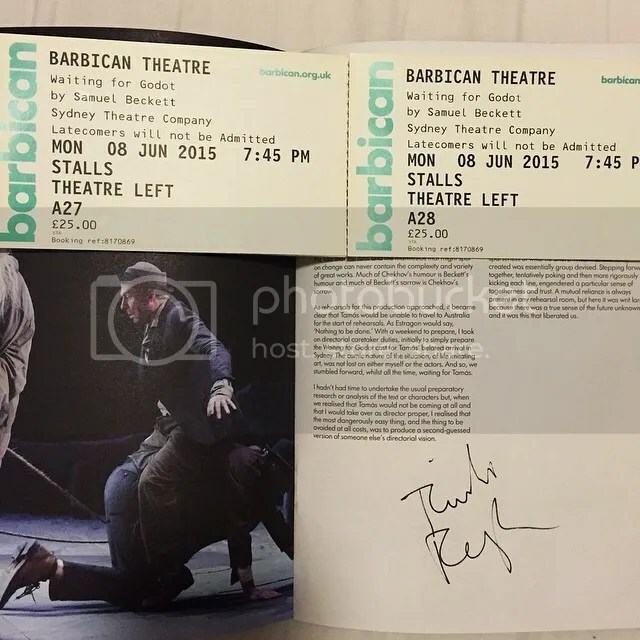 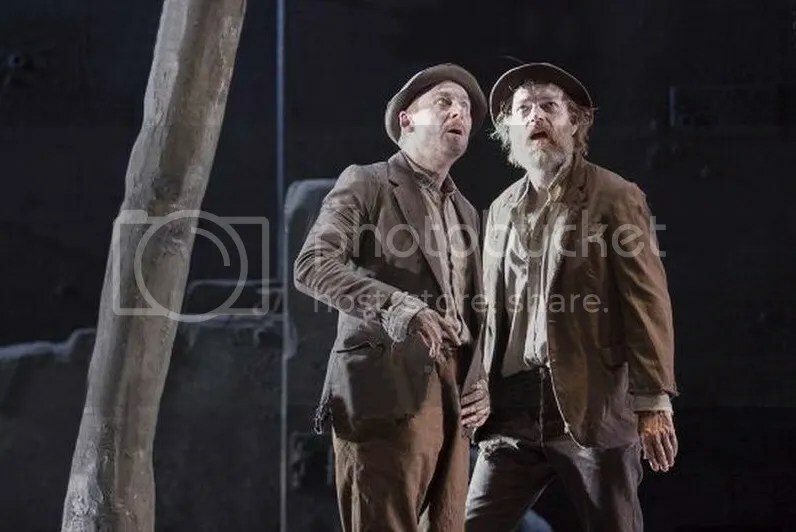 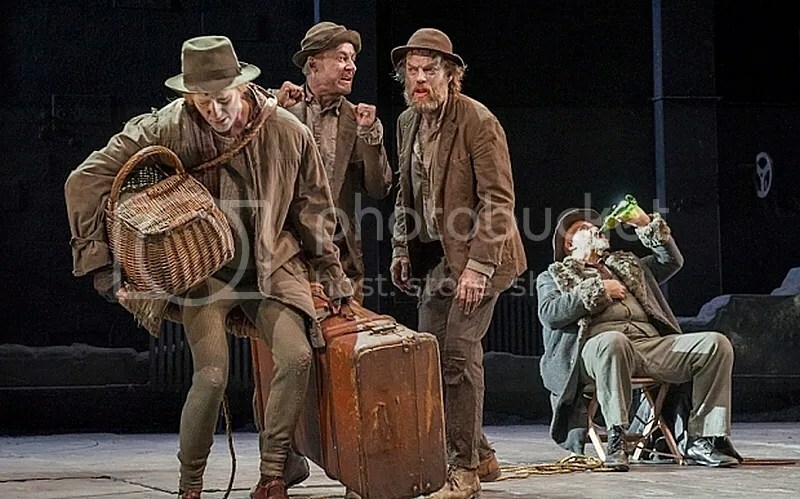 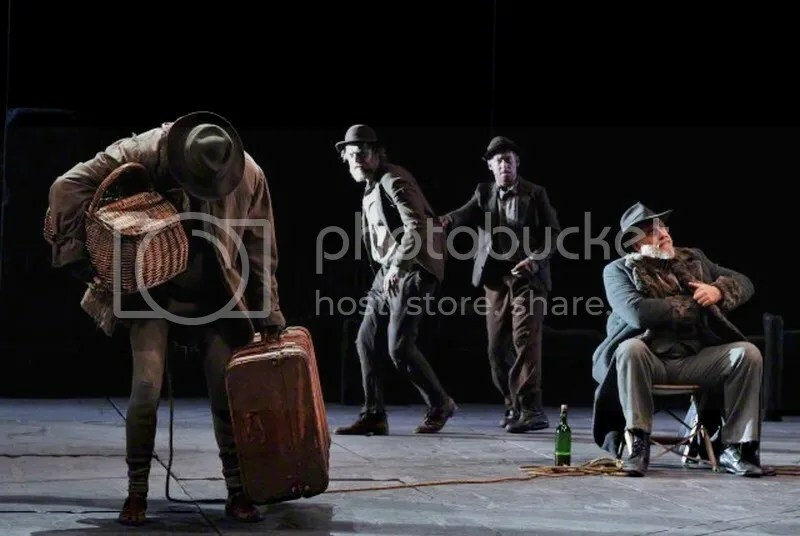 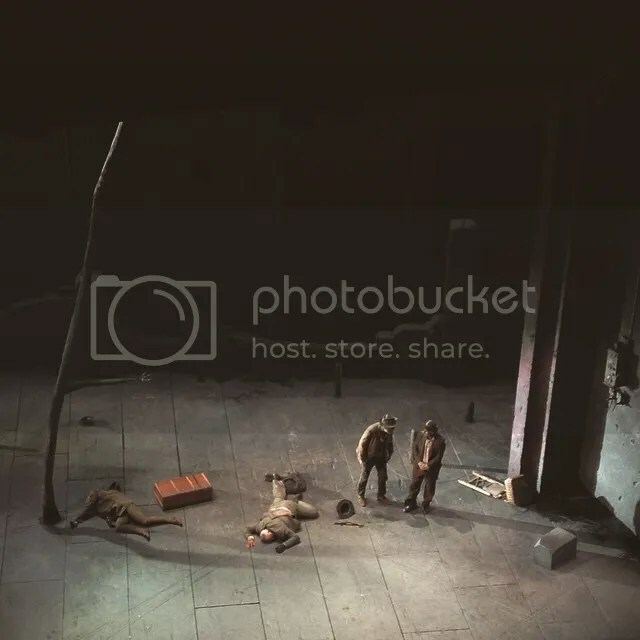 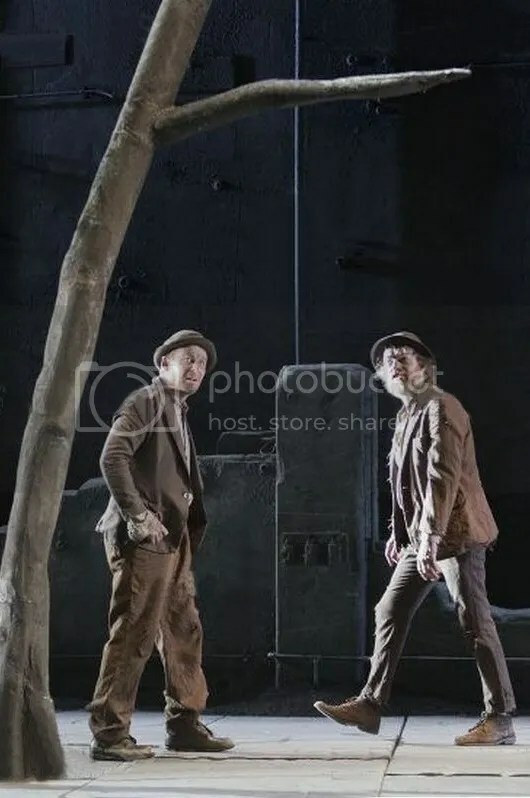 And some tickets for the remaining performances of Godot are still available at The Barbican’s website: if you are at all in the position to go, I urge you not to wait around. 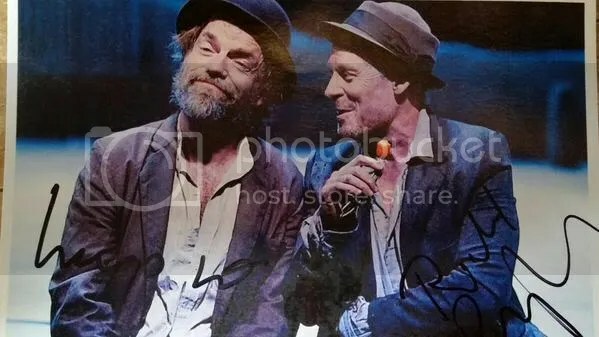 😉 More pics and reviews soon, as they become available. 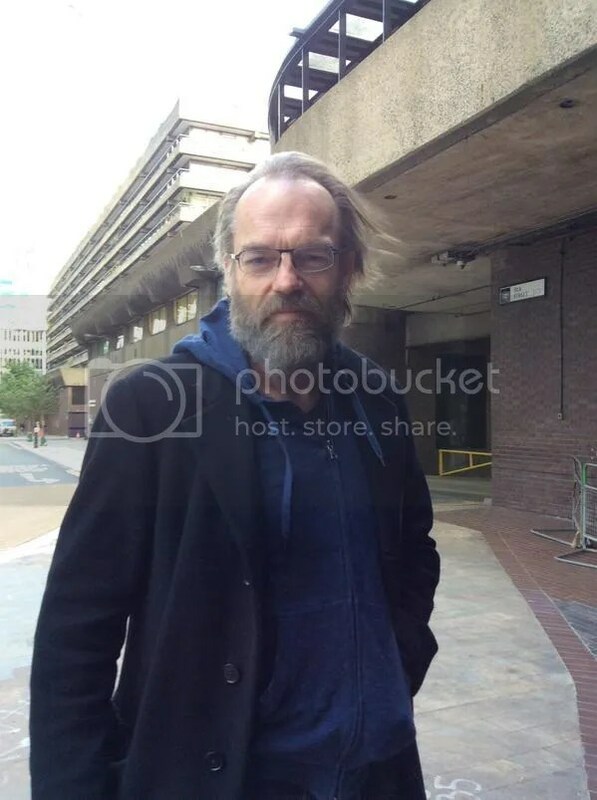 Should be a very busy week here. 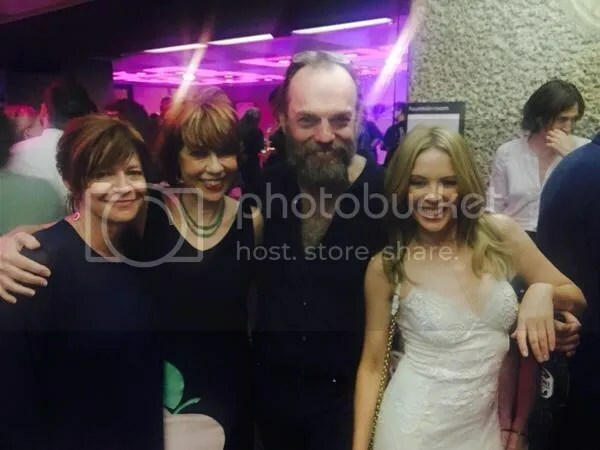 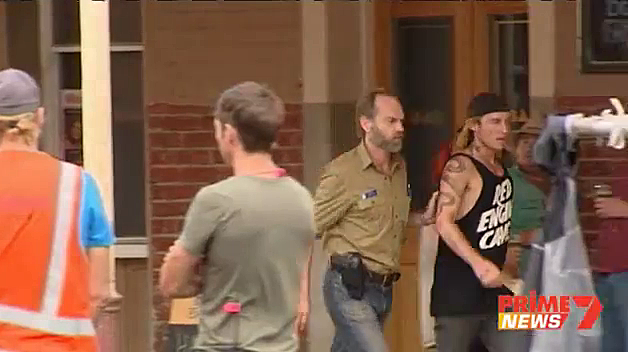 Some of Farrant’s comments from the AAP footage as well as behind the scenes footage and an interview with Nicole Kidman, appear at MSN/News Ten‘s website. 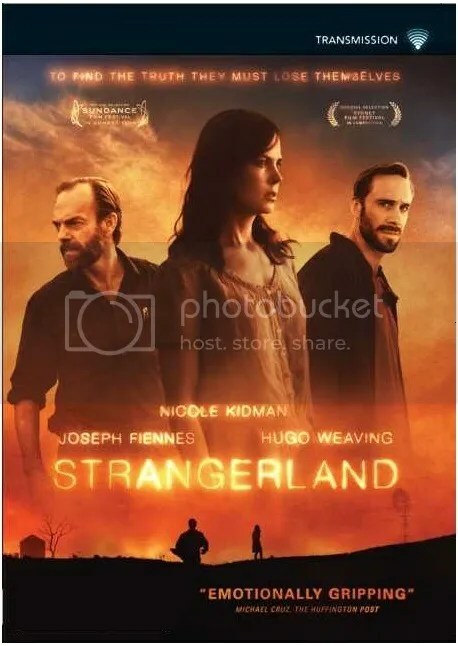 You can view a gallery of pics from Strangerland’s SFF premiere (featuring Maddison Brown, Meyne Wyatt, Lisa Flanagan, Nicholas Hamilton and Kim Farrant) at the film’s Facebook page. 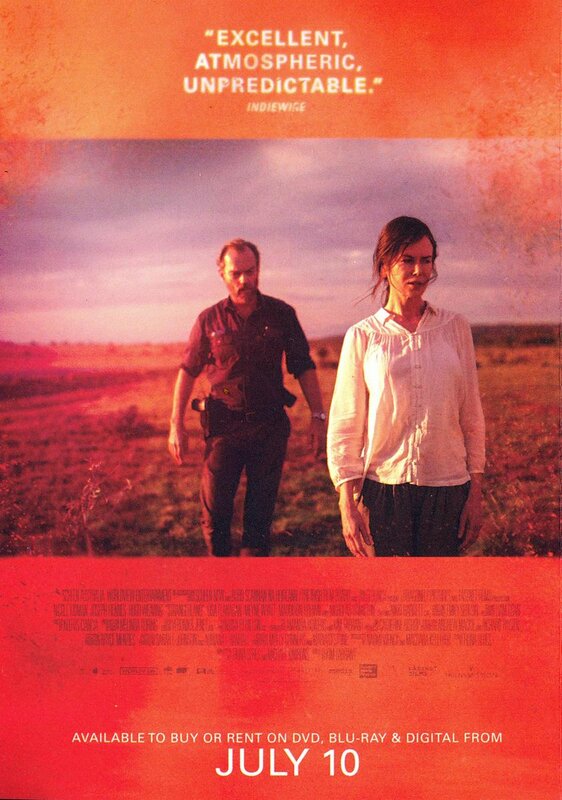 Sandra Hall, Brisbane Times/Sydney Morning Herald: “It’s the red centrepiece of Strangerland, a first feature film from television director Kim Farrant, who’s ambitiously aiming for something that sits alongside Picnic, Walkabout and Wake in Fright – films which take an anthropomorphic view of the Australian landscape. 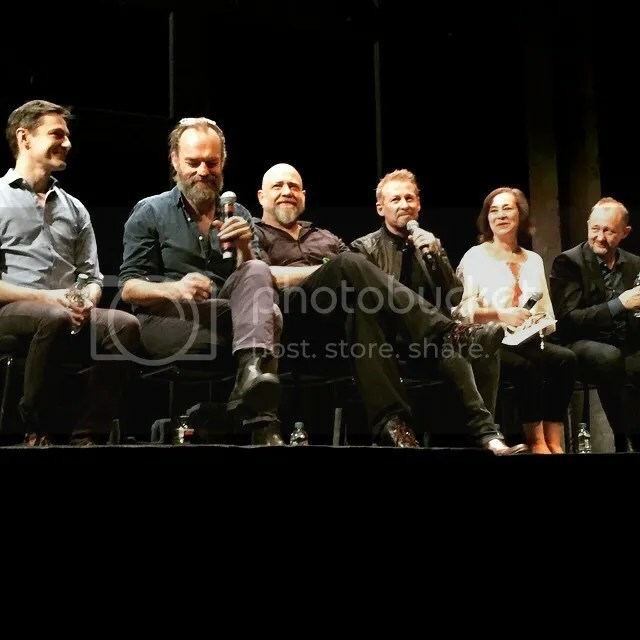 They would have us see it as a secretive entity with a way of swallowing up those who get too close to it…. 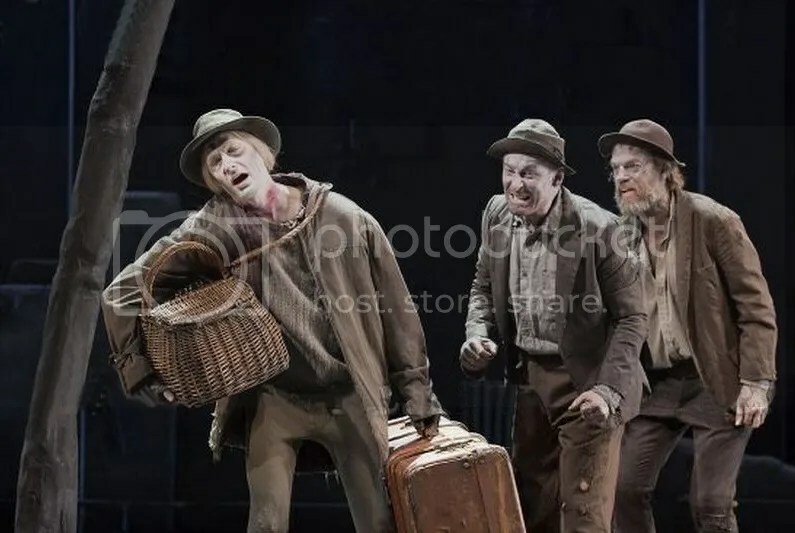 Fortunately, we have Weaving, who is such an unaffected and malleable screen performer that he brings a sharp jolt of reality to his every scene. 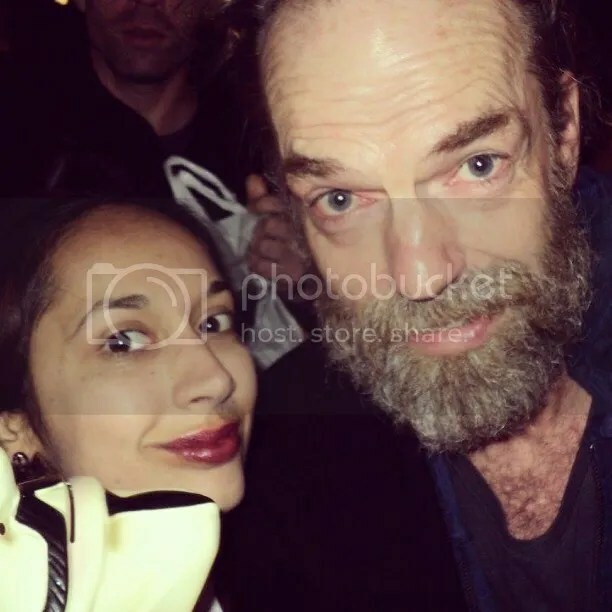 So do Flanagan and Wyatt. 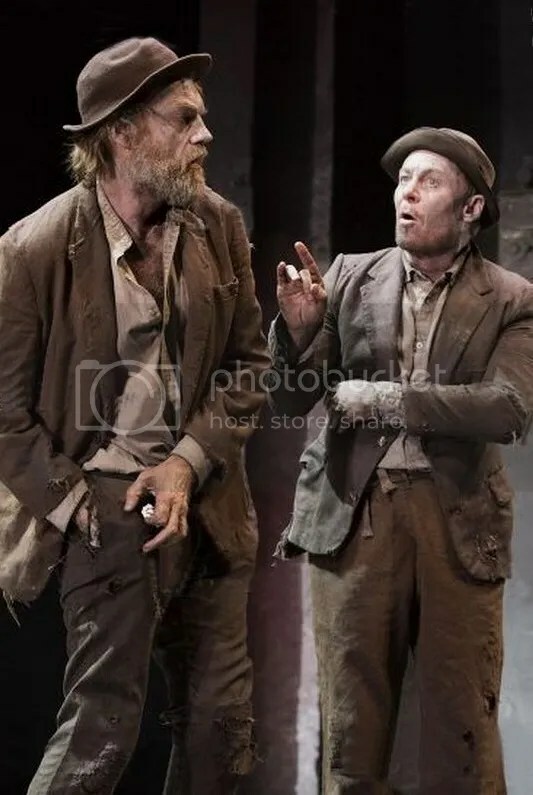 Both familiar from their great work in the TV series Redfern Now, they help to take the edge off the redneck caricatures who make up the rest of the town’s population. 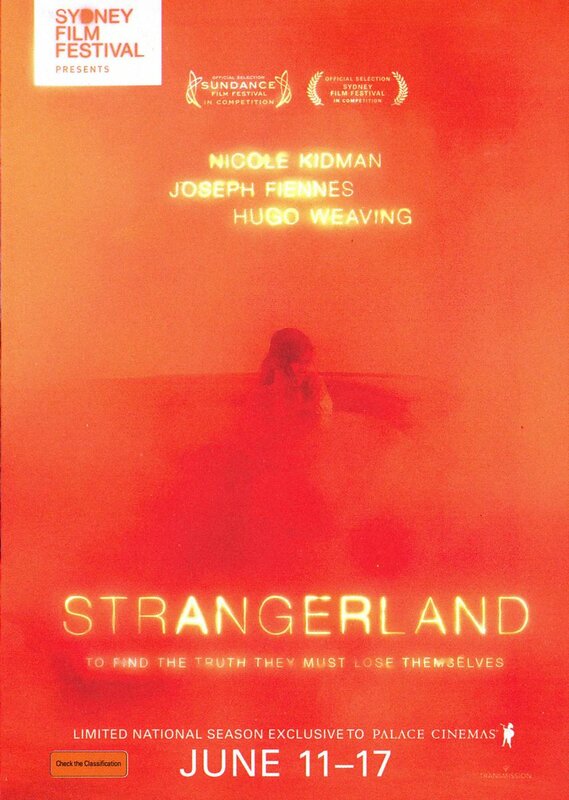 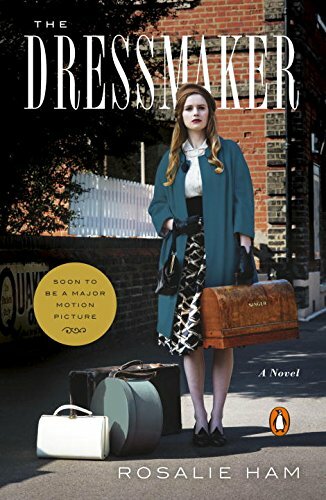 And because it centres on the mystery of two missing children, it’s a compelling story, although I’m not sure if its spiritual dimensions convince. 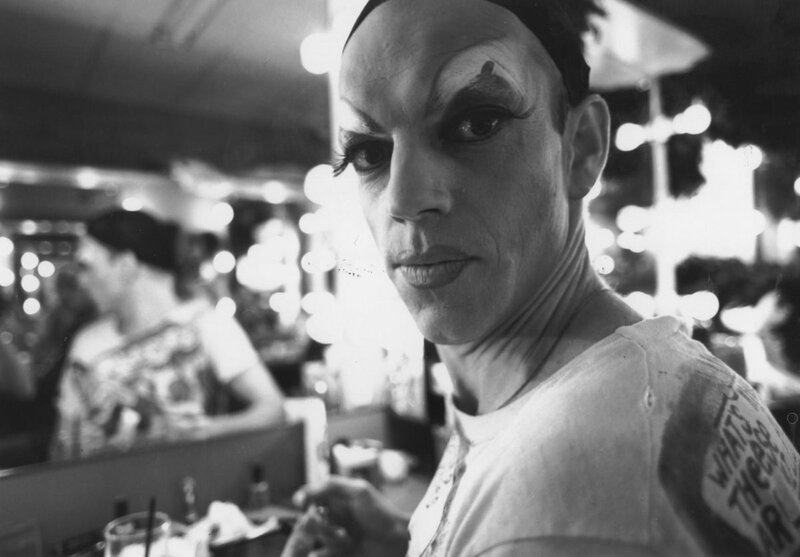 The script has grafted on bits of Aboriginal mythology which sit oddly with everything else. 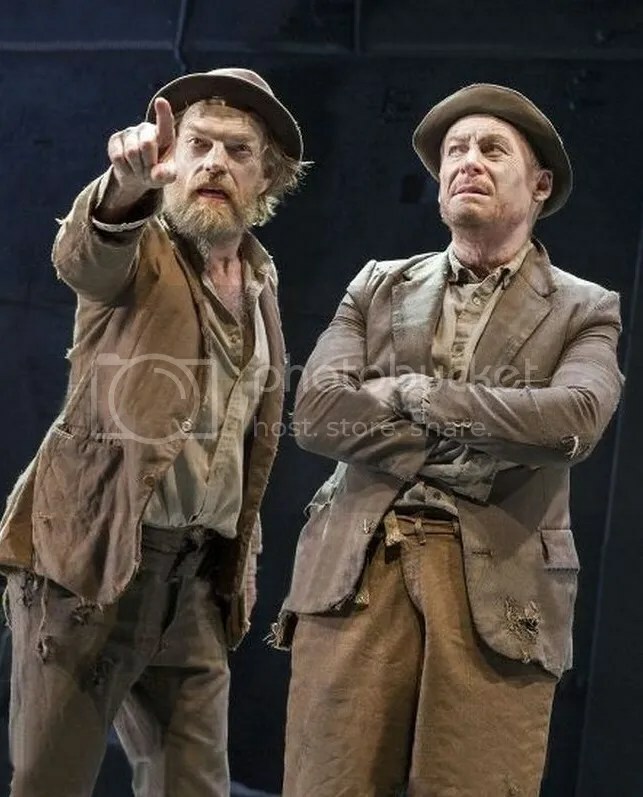 And yet the landscape weaves some potent magic.” [3 and a half stars]More to follow about both projects, meanwhile I’ll retweet/reblog all positive audience feedback on social media for both via my Twitter account.